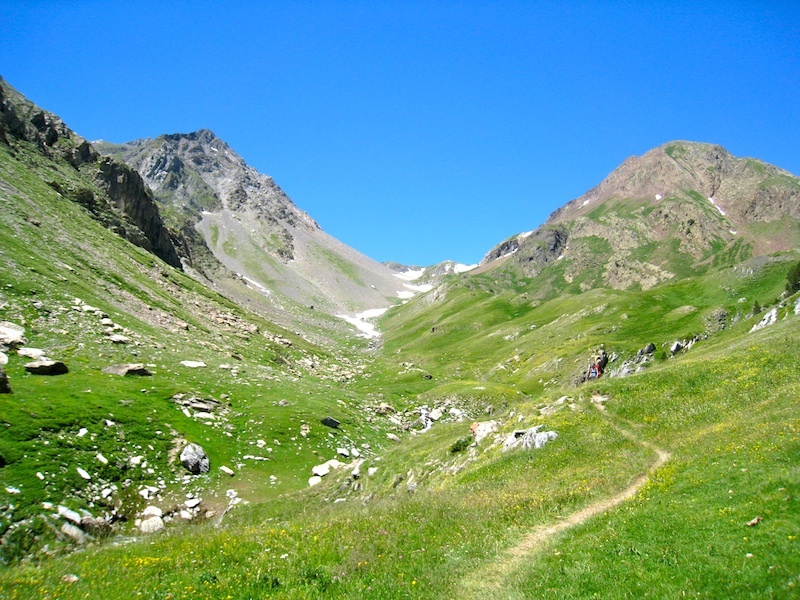 The trail GR 10 runs between the Atlantic ocean and the Mediterranean ocean on the French side of the Pyrenees and the GR 11 is on the Spanish side. 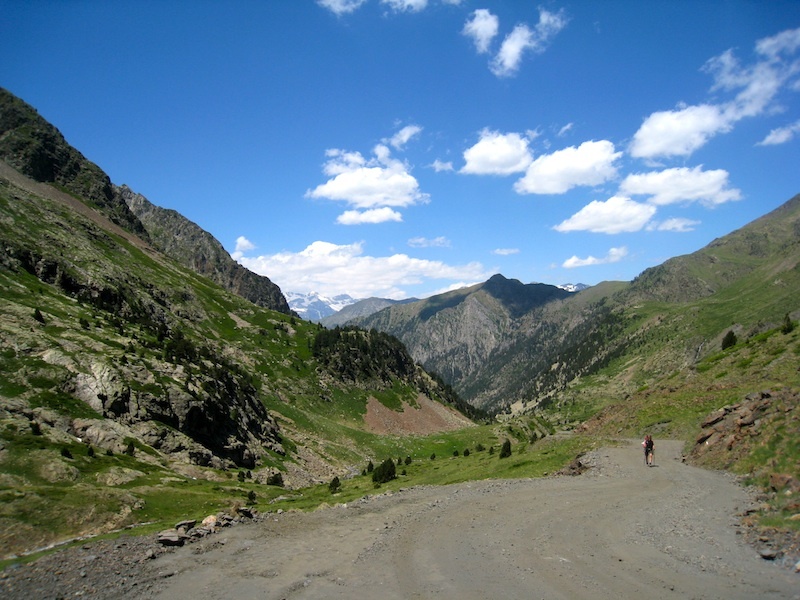 We walked for two weeks on the GR10 in the west of Pyrenees in 2009 read more about that here. 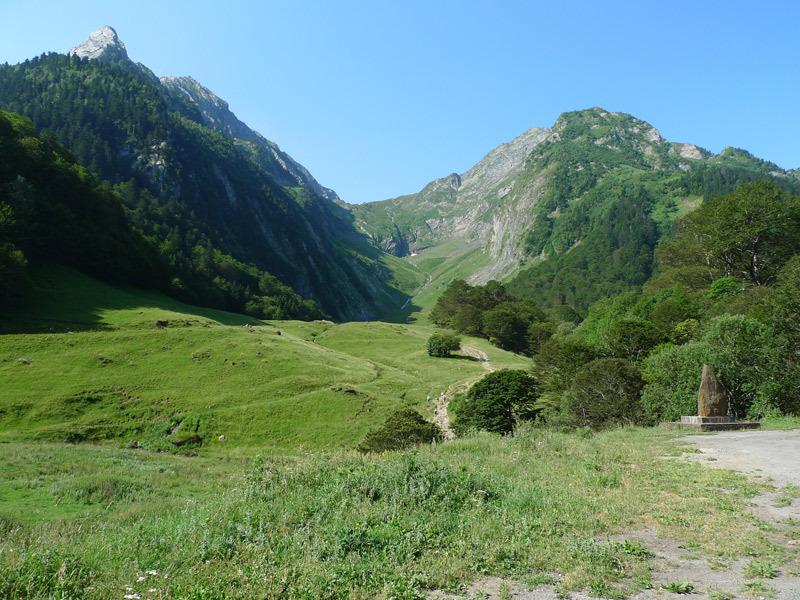 We really liked the French side of the Pyrenees and we longed back, but this time we also wanted to try to walk on the Spanish side, on the GR11. 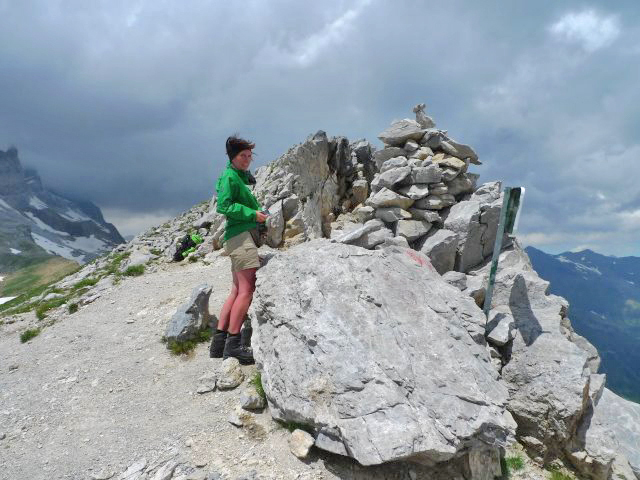 There are some places where you can cross the border by foot and that’s what we did. 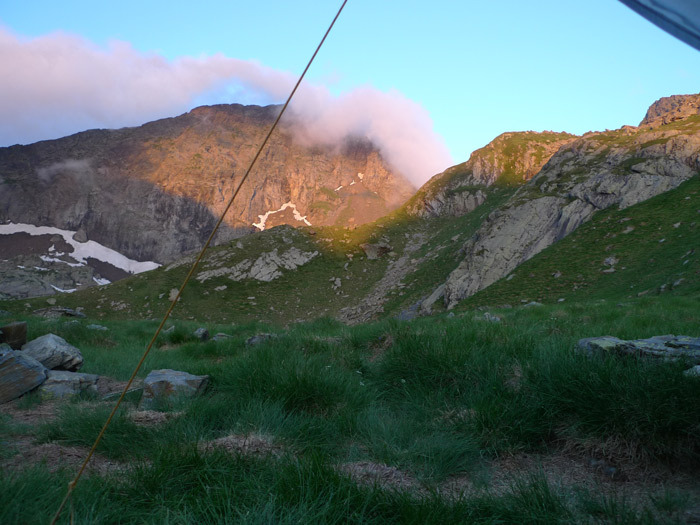 We started in Cauterets in France and walked to Spain and we walked on the GR11 for eight days before we crossed the border again and walked east back to Cauterets on the GR10. In France everyone you meet says ” bonjour”, but in Spain they say ” hola”. 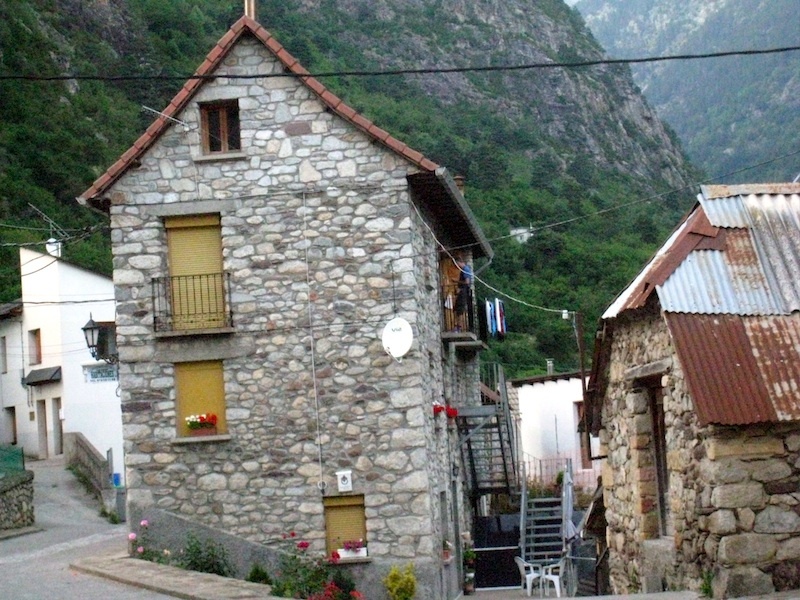 In France they call the cottages gite but in Spain it is refuge. We found the difference between the countries interesting. 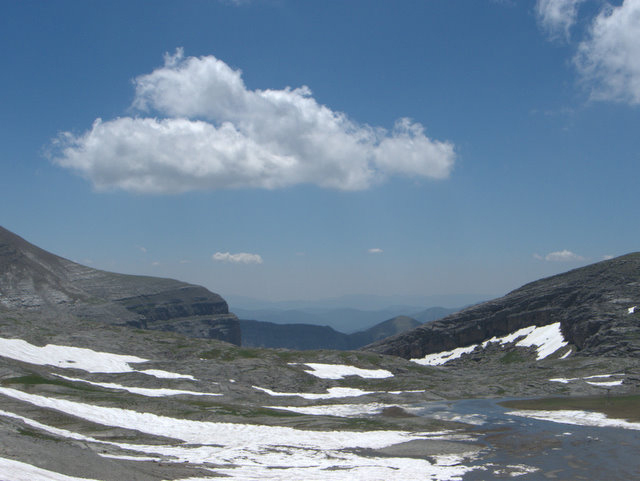 The mountains in Spain are a little higher and tougher, it was steeper, there was more snow and they were more spectacular. 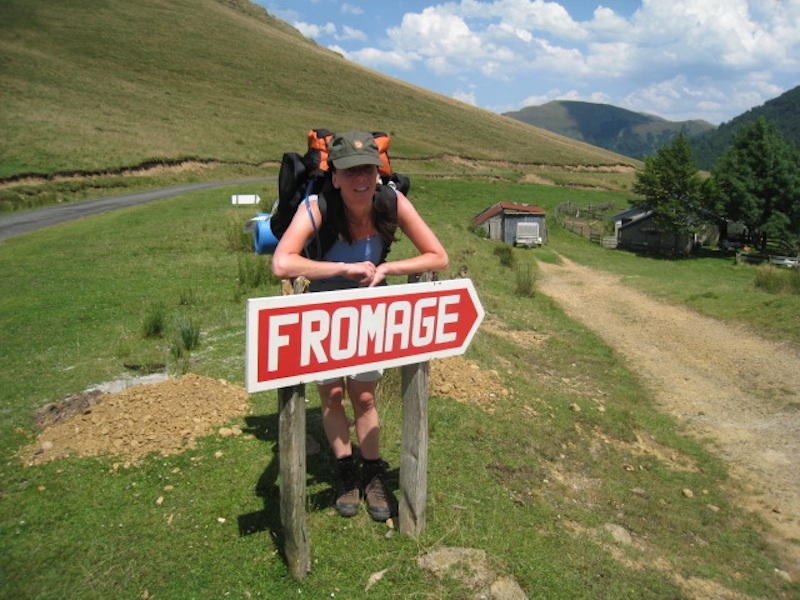 There were less animals and no farm houses that sold cheese as on the French side and we did not pass as many villages. We often get the question which side we like the best– it’s impossible to answer, both are wonderful, just different. 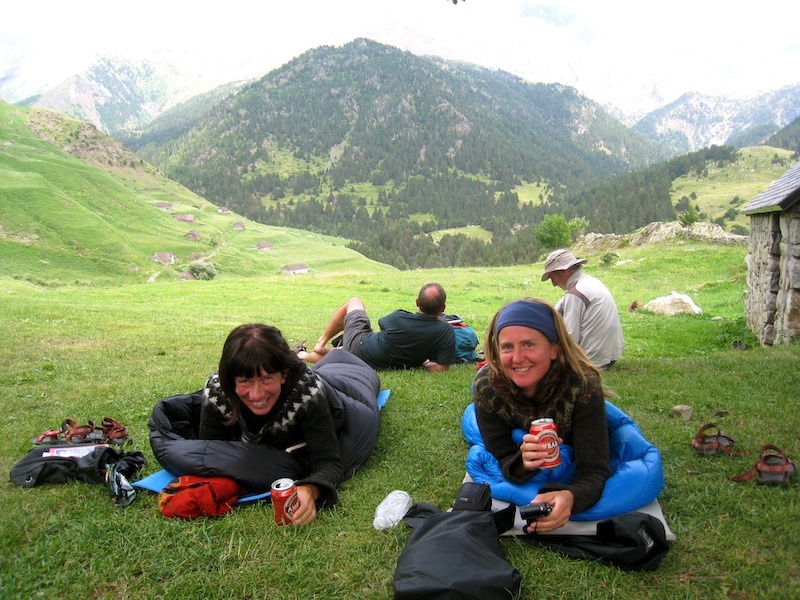 There are quite a lot of tourists in the mid Pyrenees in both countries. People are biking, doing short walks and long ones. But the nature is so huge you usually don’t meet many people during the day. You find them at the refuges in the evenings. 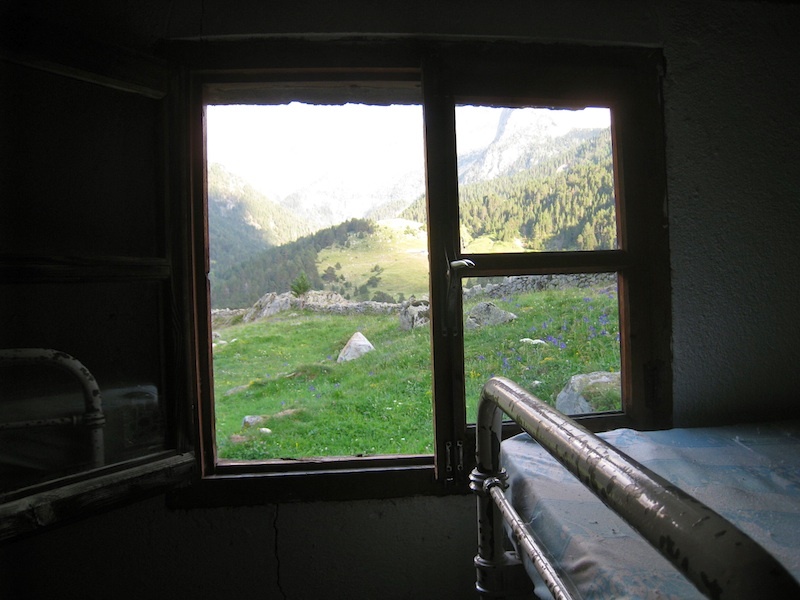 The refuges in Spain are often simple, since they are often up high, far away from civilization, there is limited electricity and hot water is a luxury. The food usually tasted good even though we got the same food for three nights in a row, chicken and beans. 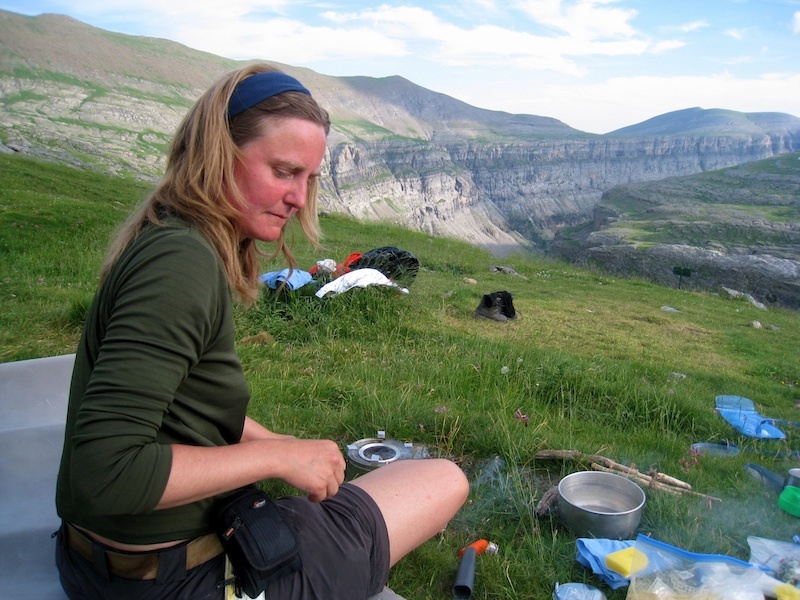 In some places you could buy some food for cooking like pasta, bread and gas for your stove. To be sure of getting a bed you should call ahead and book, usually it’s enough the night before. We didn’t do that often since we had a tent with us. You can easily camp outside the refuges or if you want, somewhere else in the wilderness. 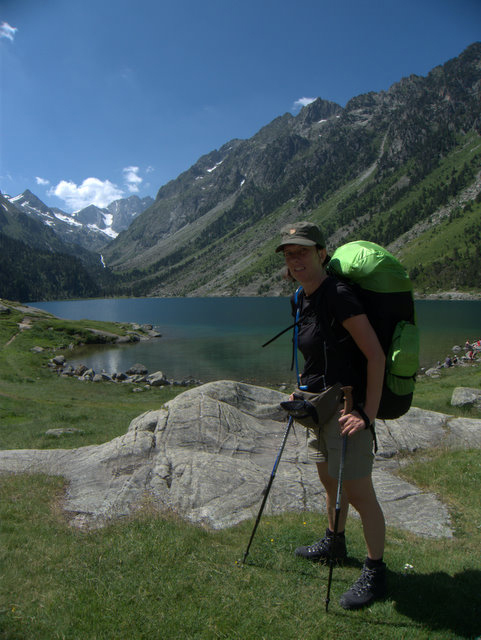 The guidebook we used was Trekking in the Pyrenees by Douglas Streatfield-James from Trailblazer. It was good, but we felt it was better for the GR10 than for GR11. Our trip marked out on Google maps. We woke up at Hotel Cesar in Cauterets France and went shopping for food. 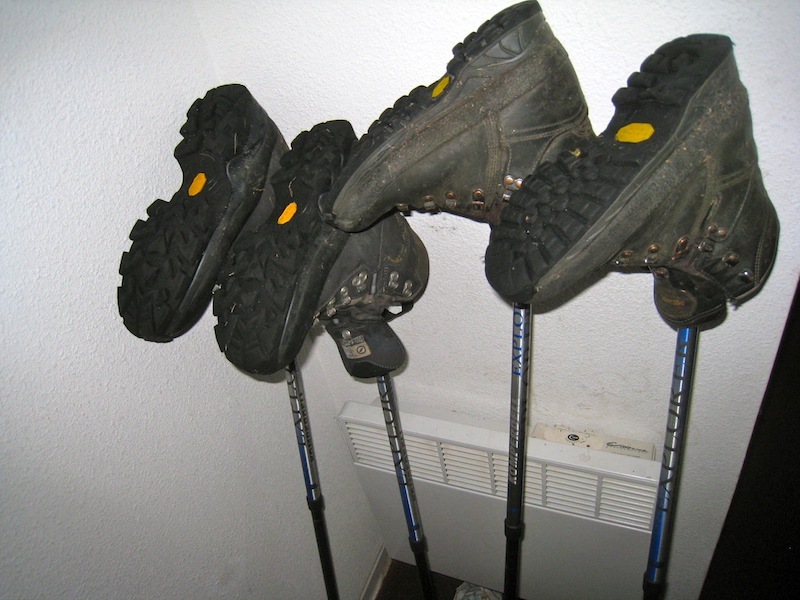 We also stopped by a nice sport store where Ýrr bought a knife and we saw some nice shoes we would have liked to buy but of course we couldn’t do that, we had everything we needed for a two weeks hike (more about those shoes later). Our plan was to take a bus to Pont d Espagne but it turned out we would’ve had to wait for two hours which we didn’t have patience to do. We decided to hitchhike. A guy picked us up and drove us to our destination even though it was a extra drive for him. 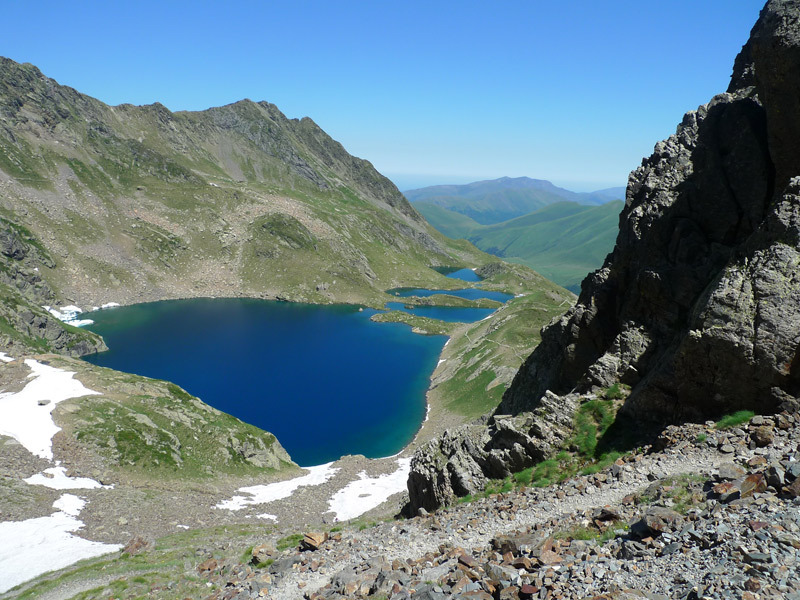 The sun was shining and we started climbing up to La’c de Gaube, a beautiful lake and of course cold as ice. We had lunch and rested for a while before we continued. The sun was shining and it was hot. 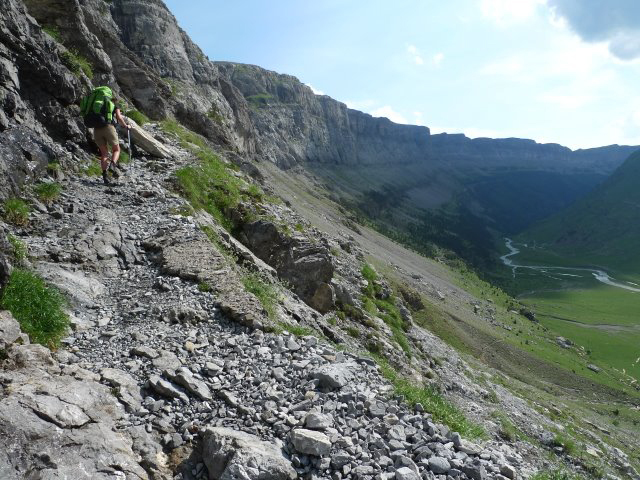 The mountain we climbed was quite steep. 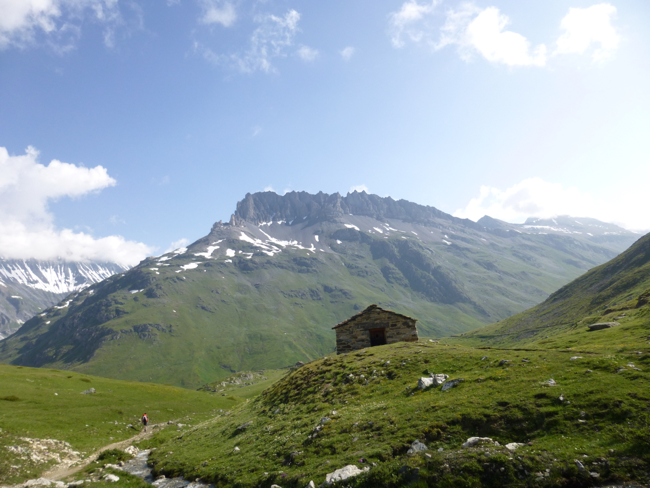 We arrived at Refuge des Outlettes de Graube (2151 m) around four thirty. We took a beer in the sun while waiting for the food. This gite was nice as the surroundings but the food was not really impressive. Dishwater soup as a starter, followed by a sausage casserole then cheese and finally lemon pudding. The cheese was good! the rest was eatable. After dinner we sat outside for a while and enjoyed the view. We were really tired and went to bed at nine o’clock . We woke up at 6.15 and had breakfast at the gite, old white bread and jam. We packed our stuff and left at 7.45. 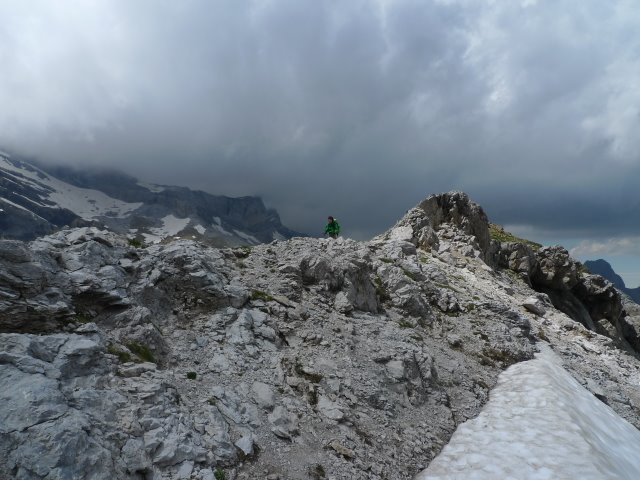 It started with a heavy climb where the last part was covered in snow. When we came to the top we were on the boarder to Spain. The view was beautiful in both directions. No pass control. We rested for some minutes and enjoyed the view. Taking a rest at the boarder looking back at France. 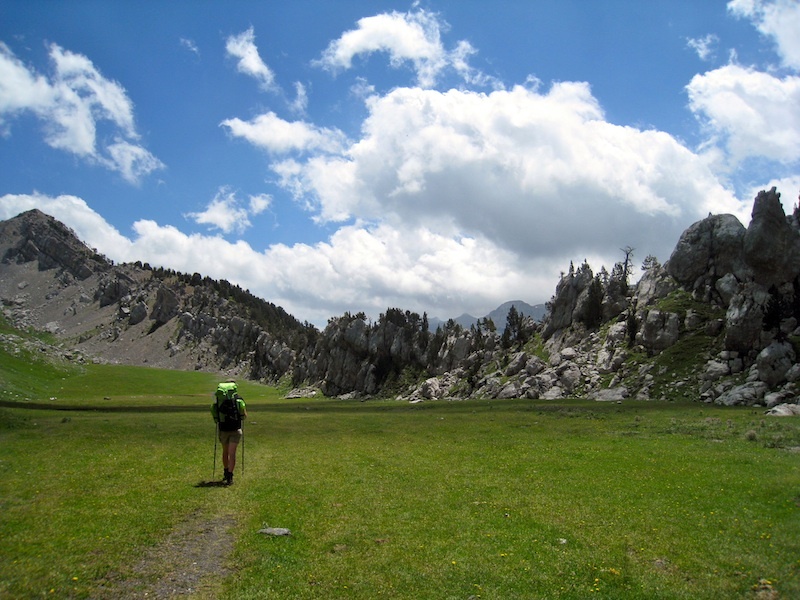 We started to walk down the Spanish valley. Looking at Spain from the top and the border. 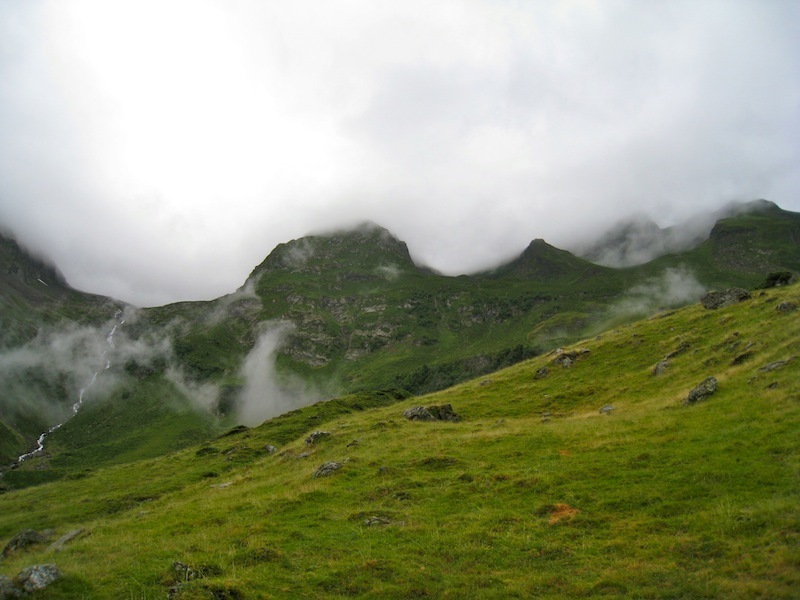 After about ten minutes we left the trail and walked down the green valley looking for the GR11 trail. We followed a small river hoping we were on the right track. 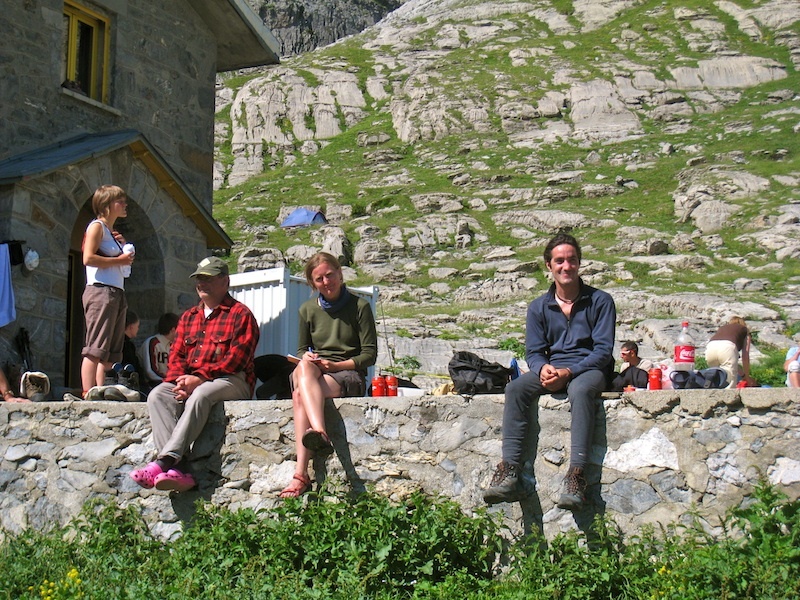 We had lunch around two o’clock and shortly after we found the track GR11. We continued walking down the valley and as so often in the mountains the weather started changing in the afternoon, it got cloudy. After quite a long walk we came to a road to follow. 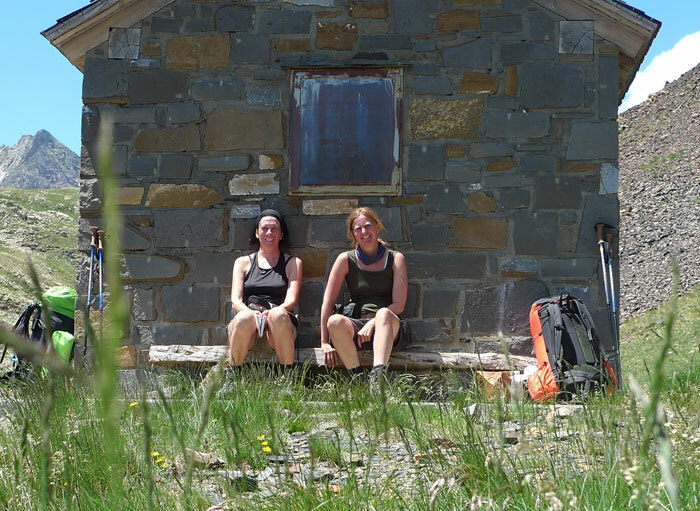 We were really tired, it started raining and we wished we had arrived at the refuge. It was like someone heard our wish, a family in a Landrover drove by and offered us a lift. It was quite unrealistic since there were no other cars around at all. 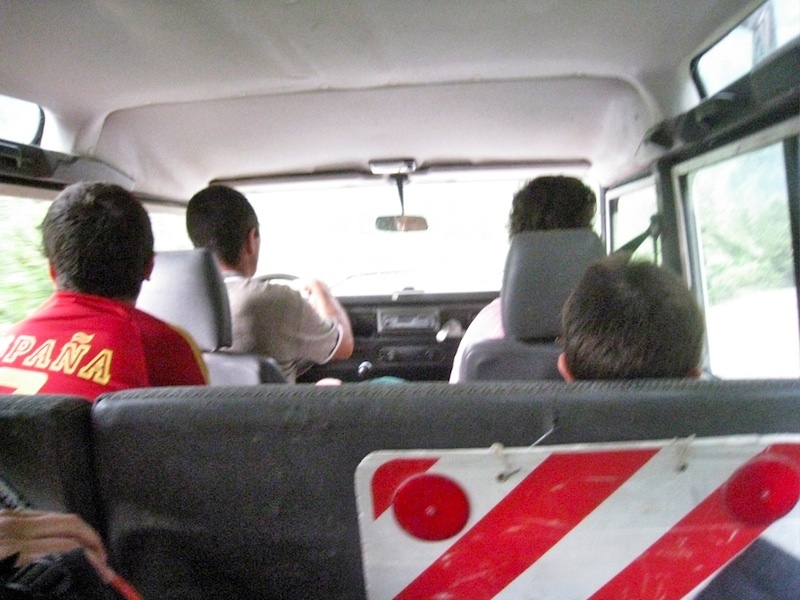 We got into the back of the car and we decided to go to Torla, a small village a little out of the track. 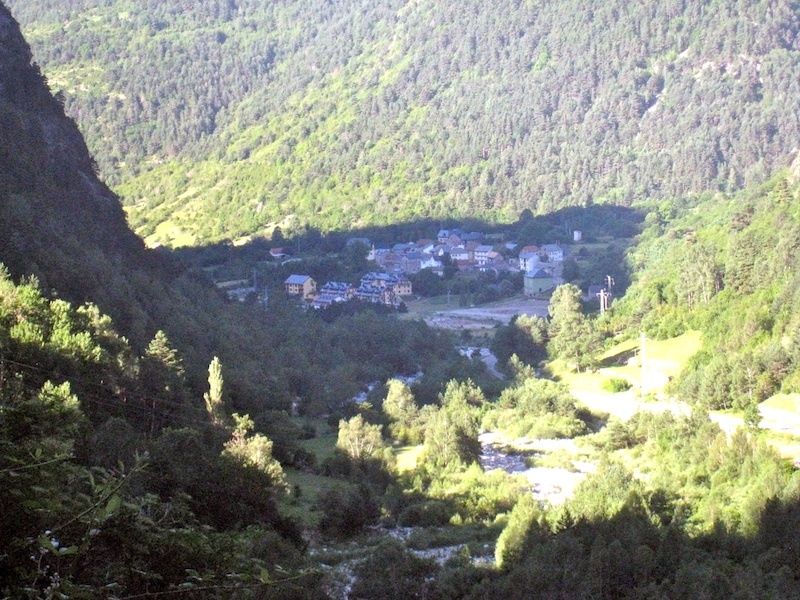 We thanked the family for the lift and checked into Recidence Briet in the centre of Torla. We went shopping for food and then we had Tapas for dinner. Afterwards we walked around to find a nice bar that would show the finals in the world championship in football that was on this evening. We found the place, everybody were there, everybody! we watched the final Spain-Holland on a big screen TV. The atmosphere was great and Spain won 1-0 which brought happiness to town and everybody celebrated even the four dutch people that were in the bar. Watching the final, Anna is really enthusiastic! The women in behind gave us a lift the next day. We were really tired and went to bed with a smile on our lips. The party went on out in the streets but it didn’t stop us from falling asleep. 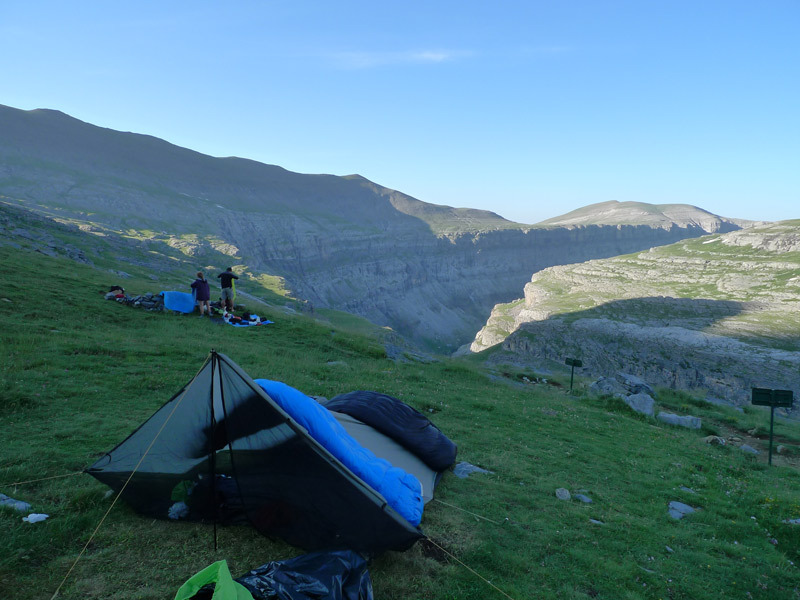 We woke up at 7.30, packed our stuff and made breakfast outside the refuge. 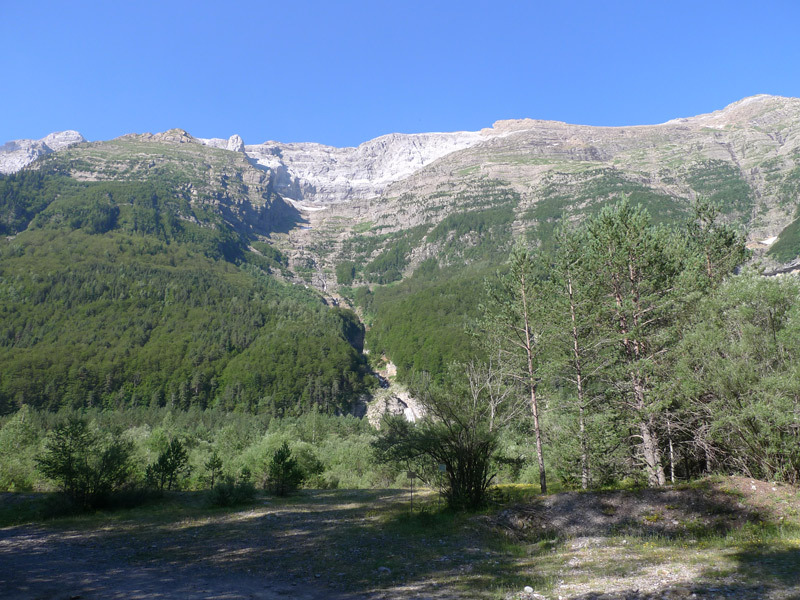 Our plan was to take a bus to the parking lot were the canyon Ordesa national park starts. But it turned out that the bus stop was not in use anymore. We hitchhiked instead. A car stopped with three women, they recognized us from the bar the night before. They took us to the entrance to Ordessa. We started walking for about two hours on a road going upwards before we came to the parking lot some buses passed us but they didn’t stop. We were at the parking lot around lunch and we bought an ice cream Magnum Gold. 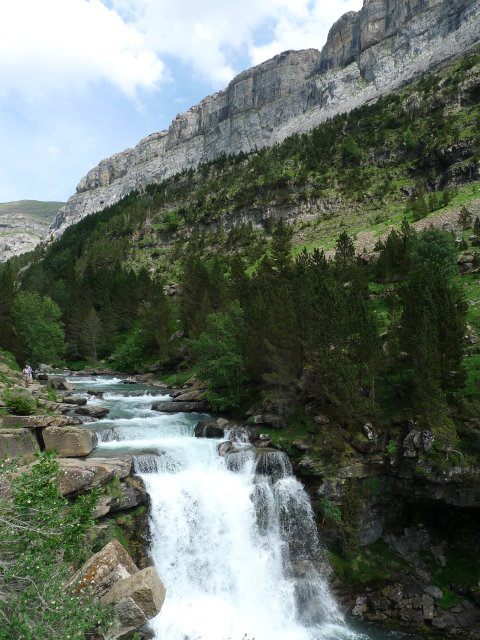 We started out by walking quite fast, there were mainly forest in the beginning but after a while we passed some wonderful waterfalls. After about two hours we were really hungry and sat down on a rock and had lunch. 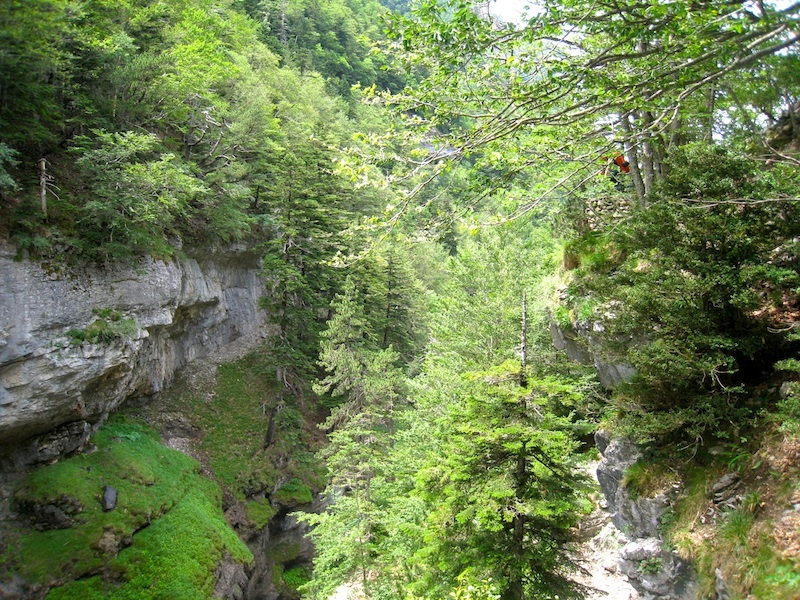 After lunch the forest became less dense and the canyon more visible. Very beautiful! We saw a lot of flowers and we saw one Lis des Pyrenées a flower we’d looked for, but without success, on our walk the year before. We came to the end of the canyon late in the afternoon, we sat down by the river, enjoyed the view discussed if we should put up a tent, or continue, which meant climbing for another 1,5 hour. We decided to continue even if we were really tired. It was hard, but somehow we always find the energy when we have made a decision, the beautiful view in the mountains is always refreshing and here it was incredible beautiful! 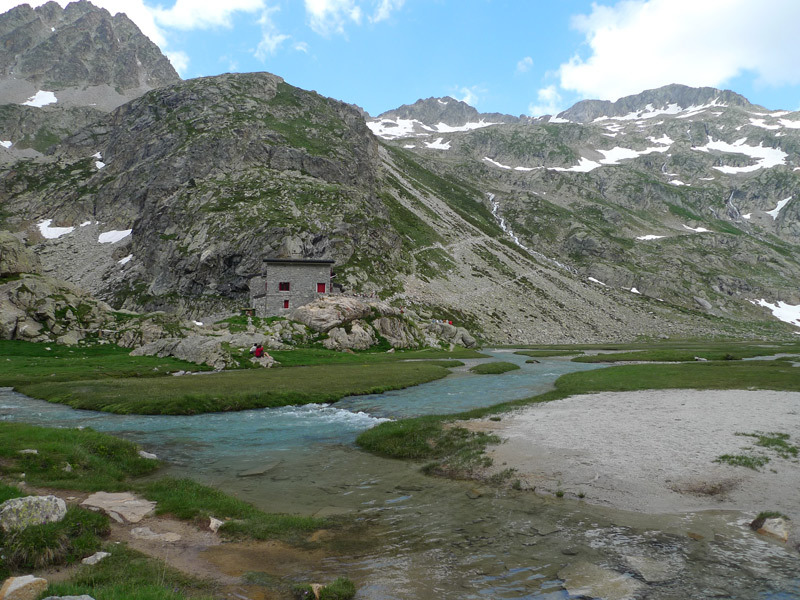 We arrived at Refugio Goriz (2200 m) around seven. We started to cook dinner but it didn’t go very well, it turned out our stew was broken. We were tired and hungry and after a couple of hours of struggling we borrowed a stove from some people. We made some Thai stew with couscous and ate dinner at ten o’clock. Because there were no free beds for us we’d put up our tent outside the refuge. After dinner we had a glass of wine at the refuge before we went to sleep. We woke up early and decided to stay one extra night at Goriz, it was a very special place to be and we decided to take a walk to Breach Roland. We ate our breakfast and packed one backpack with things we needed for the day. 98-365 It felt nice but strange not to carry so much on your back. 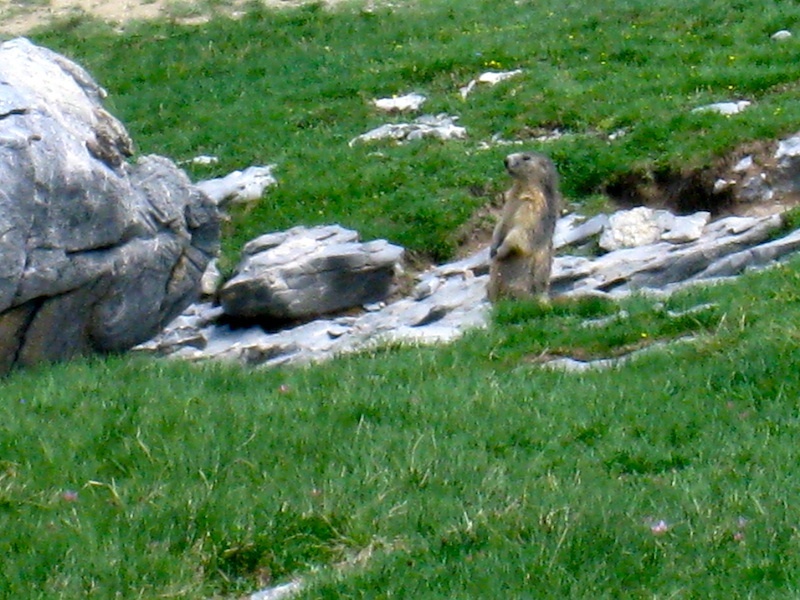 The sun was shining and we followed a path through a valley with grass and rocks with a lot of marmots. 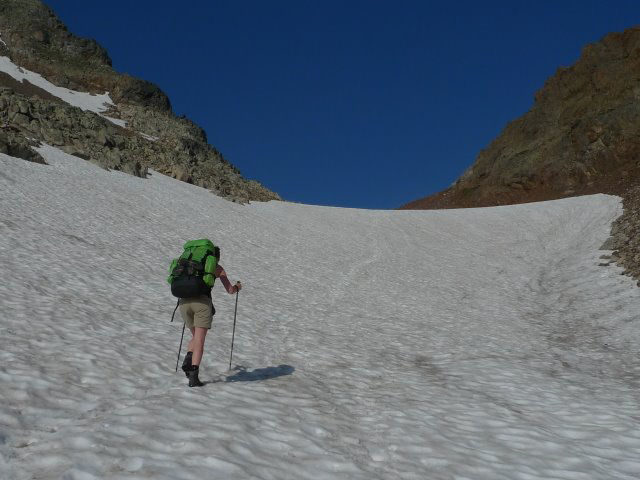 At some places we had to walk on snow, here and there it was a bit scary as the snow was melting and we didn’t know if it would hold our weight. We took a lunch break close to Gruta Casteret. We had a great view over the deep valley and down below we could see a big group of Isards walking around. Two Dutch hikers came down from Brech Roland, we recognized them as they had their tent next to ours the night before, they had decided to turn back since there was too much snow up at the Brech Roland, this made us rethink and instead stay a bit longer where we were. 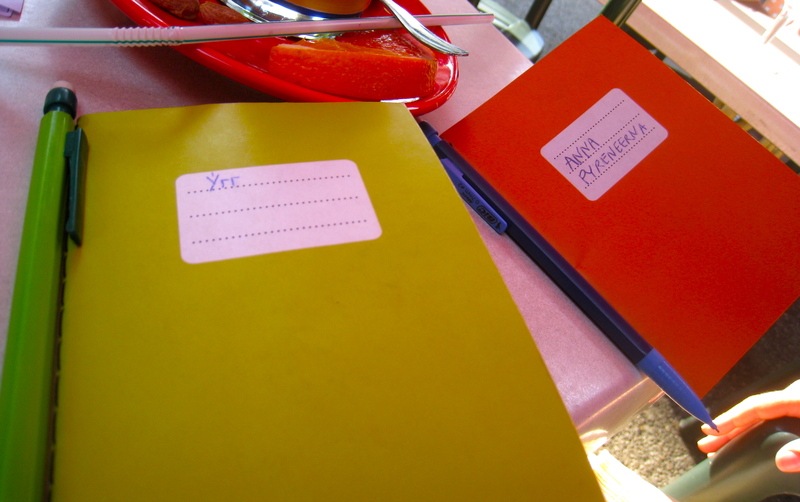 After the lovely lunch with bread and canned octopus, we laid down in the sun, took and nap and wrote in our travel journals. We stayed for a few hours; it was nice to take it slow, for a change. We took a nice and slow walk back to Goriz. We didn’t see as many marmoths on the way back and we where thinking they probably had taken a siesta. Back at the refuge we took a really cold shower, the refuges at remote places usually have simple facilities as you can’t come there with a car, only by foot, dunkey or helicopter. We sat down outside of the refuge and drank a beer. 156-215.80 It was a nice place to sit and look at all the other hikers and the beautiful view. For dinner they served us a rice soup, meat with celery and mashed potatoes and for dessert a pudding with biscuit. It tasted good. Anna about to climb up to her bed. After nine o’clock we went to bed. 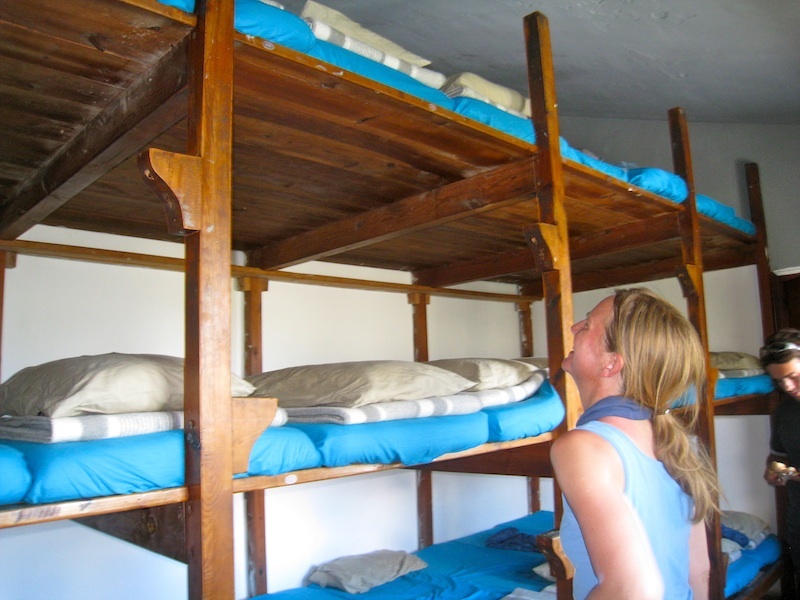 This night we got a bed inside the refuge in a small dorm with 30-40 beds in three etages, we got our beds on the top. A bit scary to climb up. We got up early, we knew we had a long and difficult day ahead. We made breakfast, packed our stuff and started walking. After about half an hour walk we realized we were on the wrong track. We had to go back and find the right track, we lost about one hour! We met some Spanish people we had seen the day before. they didn’t speak English but they gave us a sip from their pocket flask. 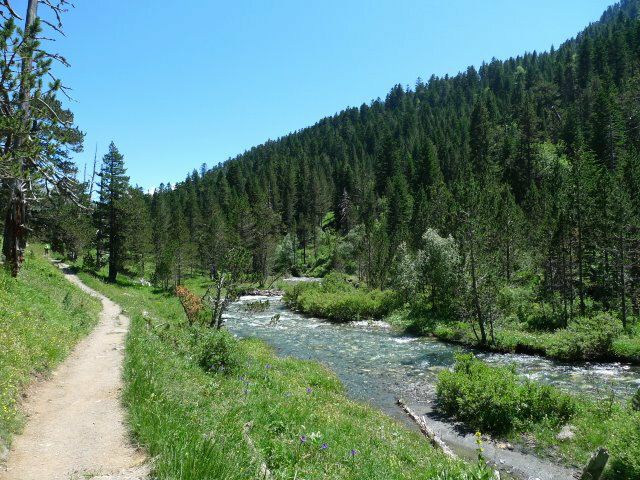 We started by walking down a valley. Some parts were really steep. 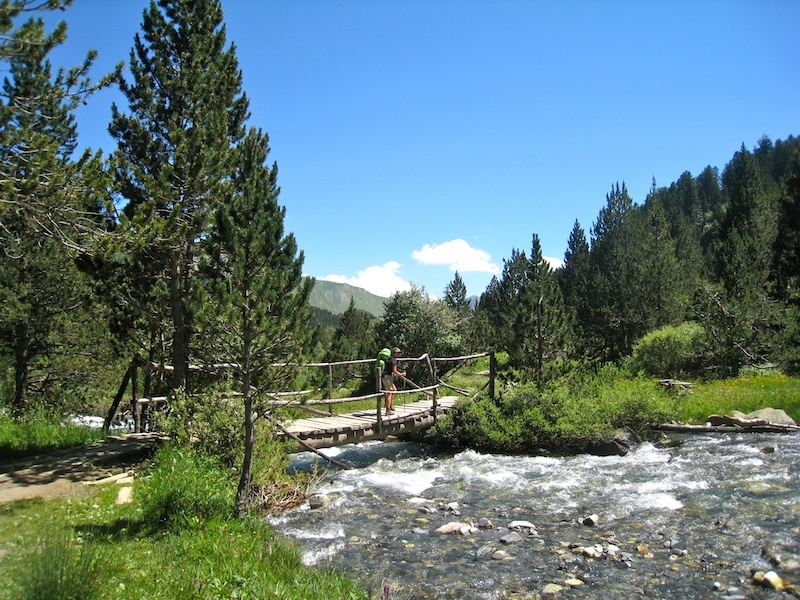 We came down to Fuen Blanca (1700 m), a beautiful valley where some people where camping. 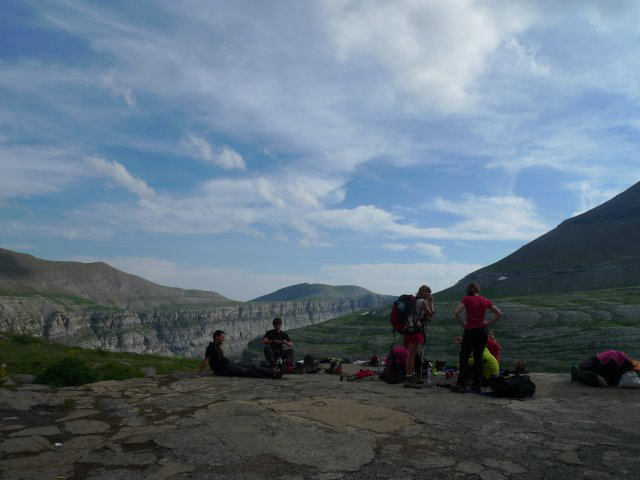 We had lunch, canned sardines and bread, before we started climbing. 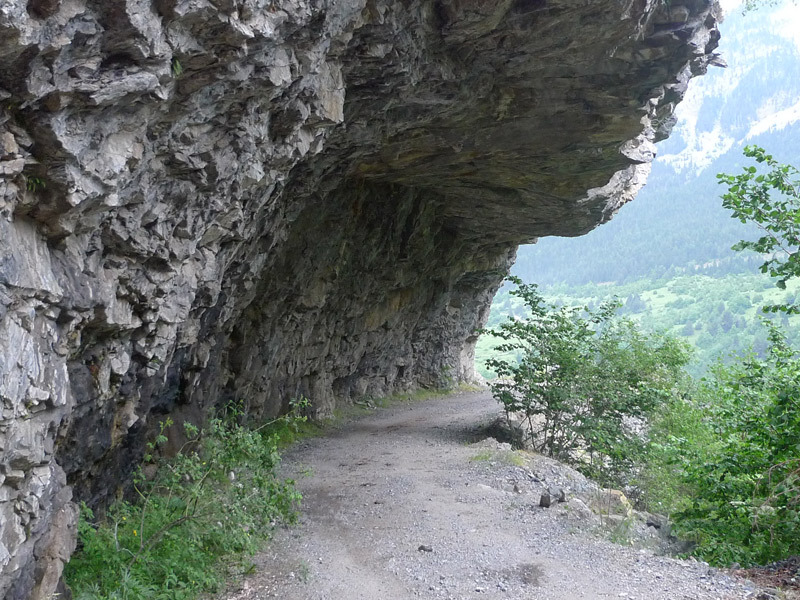 It was a tough climbing of 700 m. We met some people on the way going the other direction. 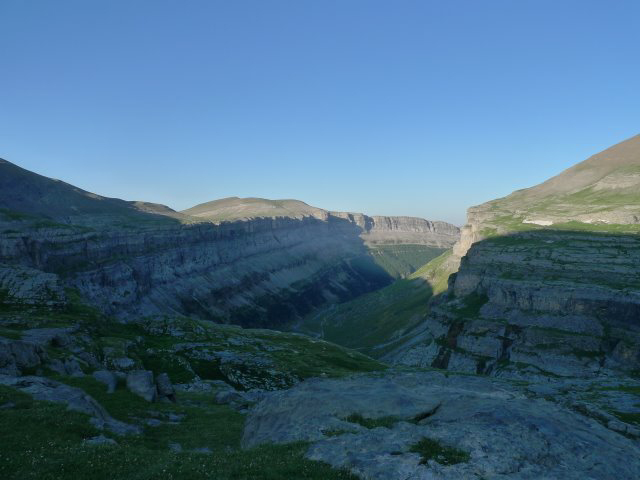 A fantastic view waited for us at the top Collade Aniscio (2453 m). At the top looking down at Fuen Blanca on the one side and Pineta on the other. Pineta (1300 m) the place we were on our way to was really far down in the valley. We got vertigo! We had some bread and sausage before we started descending. It was really steep and difficult. Actually this was the most difficult part of the trip. 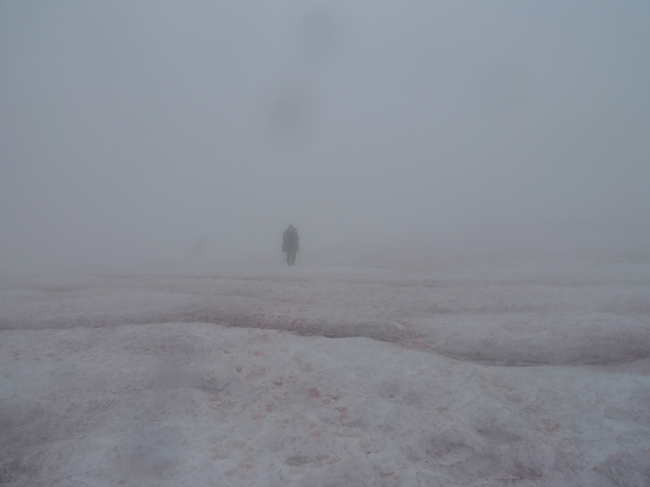 We had been warned by the guide book and by people we met and we had been nervous the whole day. It was difficult but it was doable even for people like Ýrr that suffers from vertigo. We walked really slow and careful and concentrated us on following the marks. The top was worst, farther down it was more zig zag. We were really pleased with ourselves that we managed the toughest part and we considered us done, Pineta seemed close now. We thought we had an hour more to do, but we were fooling ourselves. 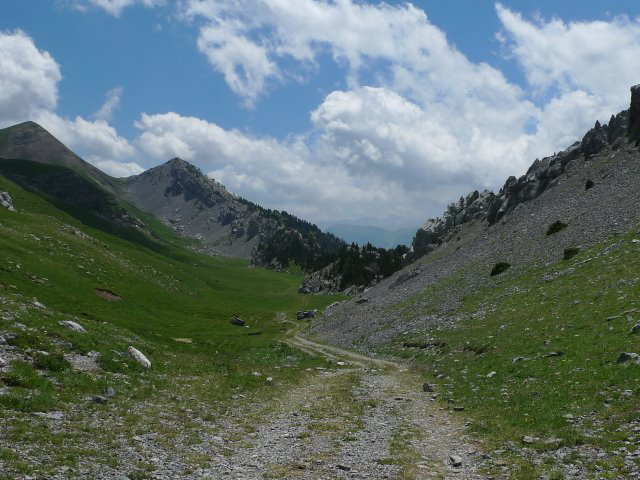 The track didn’t go straight down it lead us to the right along the mountain and into a forest with a rocky and difficult terrain. We were dead tired and grumpy, but we managed. It took us four hours. When we came down we had to take off our boots and wade the last part to the Refuge. We have no pictures from this afternoon since none of us thought about taking pictures, I guess we were to tired and to concentrated. We ate dinner at the refuge and fell asleep! Our bodies were tired when me woke up. We had breakfast at the refuge and it took us a while to get started. 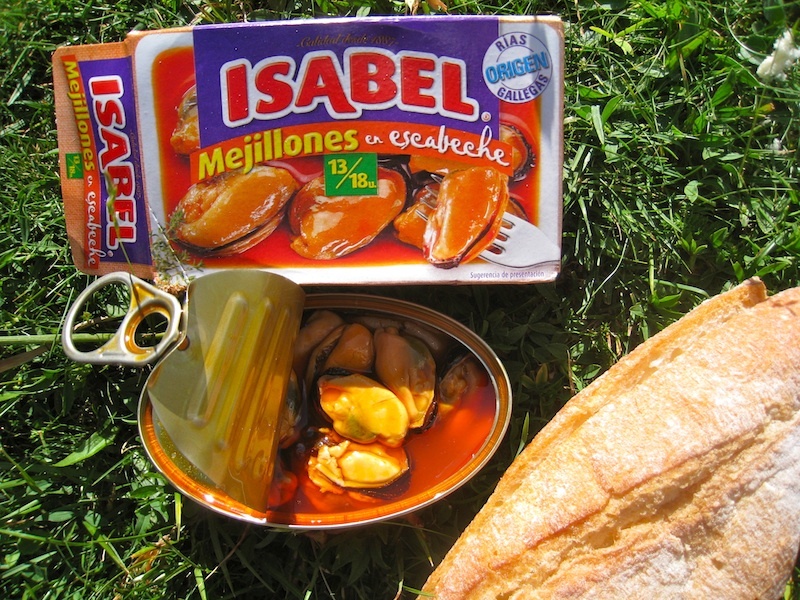 We walked to the camping that was close by and bought some lunch, bread and canned clams. Looking back at the steep mountain we climbed down from the day before. Then we climbed up to a green plateau, in a nice little valley with a lot of day walkers. We had some problems finding the trail but finally we found it and started climbing. Pretty soon we stopped for lunch. Typical lunch in Spain. Caned see food, tasted delicious. Then there was a lot of climbing. We always thought we had reached the top… but no. 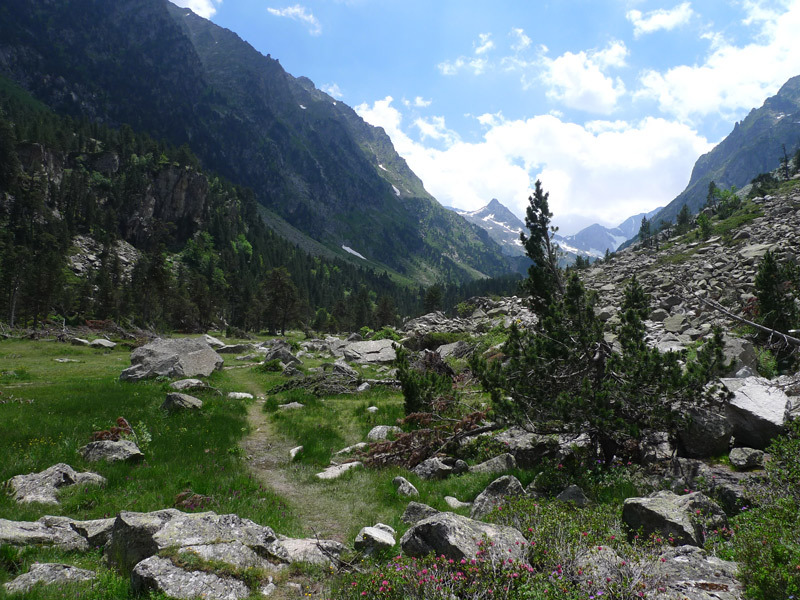 Finally we came to a new green plateau surrounded with rocks, very beautiful. 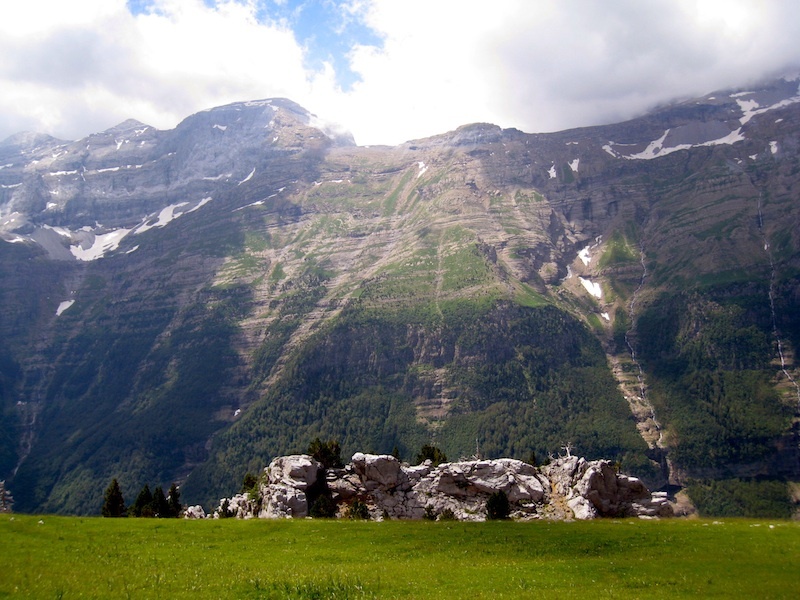 Green plateau surrounded by rocks. Looking across the valley at the ”wall” we walked down the day before. 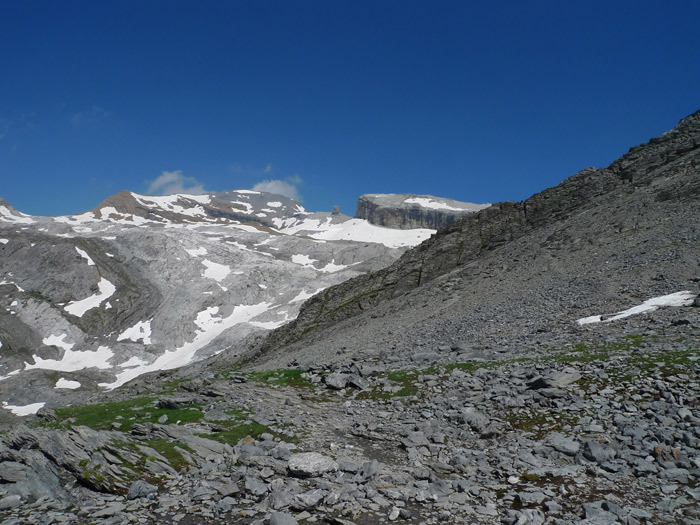 We continued with a short climbing to reach the top of this day (Small Col 2100m) . Anna at the top, Small Col.
We walked slowly down on the other side of the mountain in a nice national park. Our bodies were sored from the day before. After about an hour we came to a parking lot and a road. We sat down and rested. There was only one family at the parking lot, we started talking to them and told them we were really tired. They offered us a lift down the road to our destination Parzan, we accepted. 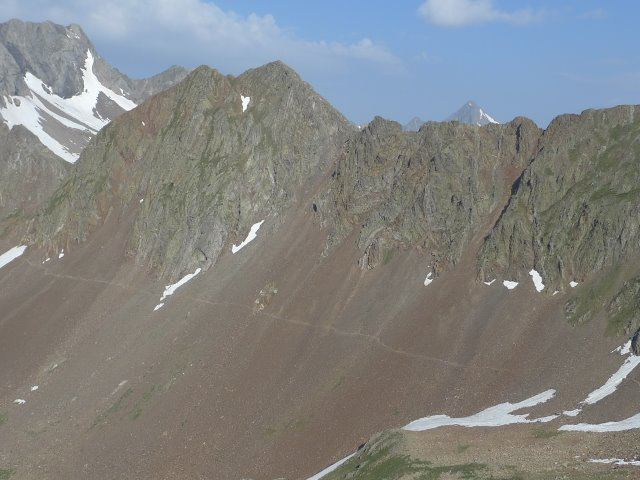 Parzan (1144 m) was a strange little town. It was on a highway with a big petrol station and a store. 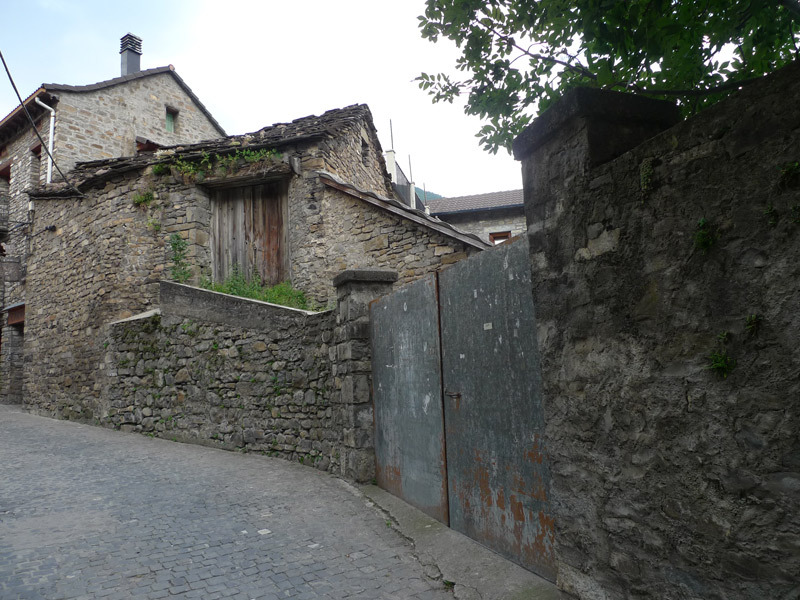 There was also a big hotel and some old stone houses. Our guidebook recommended Casa Marion. A house with modern flats, very fashionable for us! We bought food in the store and cooked in our kitchen. We had some wine and gave the rest to our neighbors in the flat next door, four nice people from Israel and Spain we got to know better later. After dinner we took a walk around the town. We slept well in our big bedroom! We woke up early and made breakfast in our kitchen. We payed our room, thanked Marion and gave him the rest of our milk. Marion and Anna outside Casa Marion. 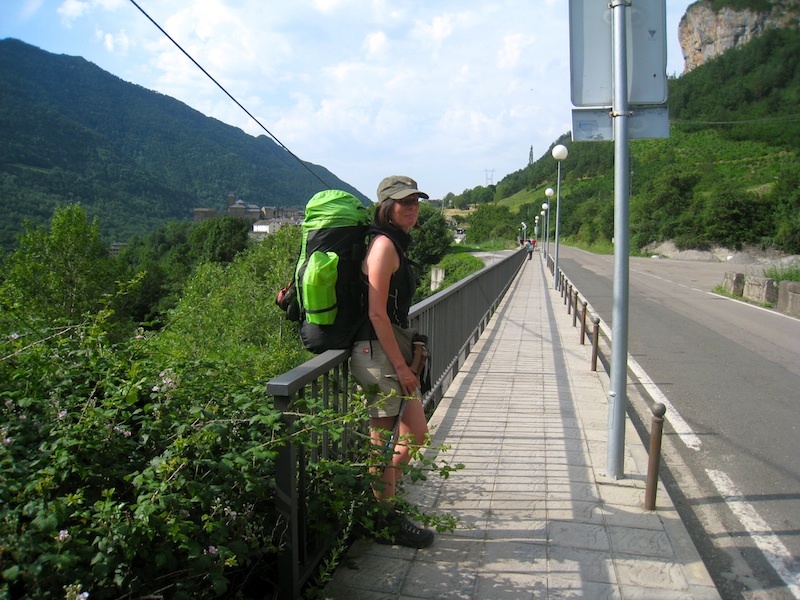 We started walking along the highway, it was boring and we tried to hitchhike but there were no cars. Parzan in the shadow of the mountain. After a while the track turned of the highway and we started climbing. After some hours of climbing we came to a power plant and a lake. We had lunch and we bathed our feet. 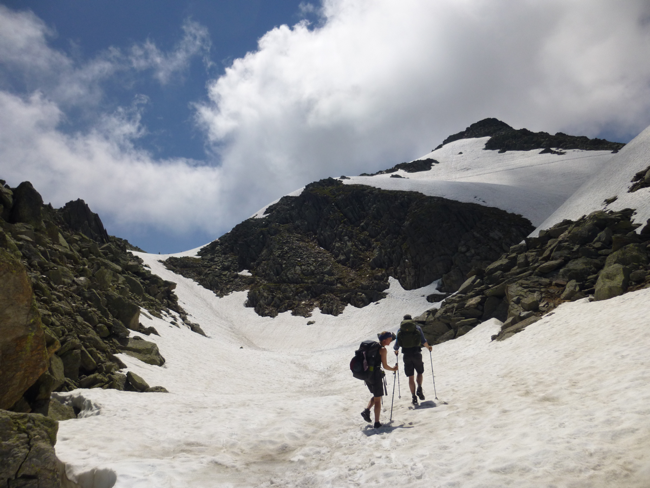 We continued climbing to the top, Collata Chistau (2324 m). There was a small house on the top, we rested a short while outside and enjoyed the view before we started walking down. For a long time we couldn’t find any track marks and we thought maybe we were on the wrong track. 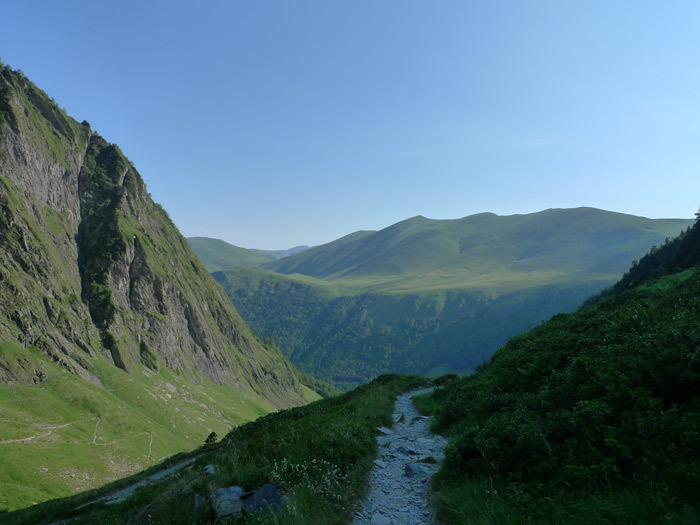 We came to the bottom of the valley and started climbing, we were worried and grumpy. But finally we found a mark and figured we were on the right track and our mood became so much better. We were happy for a while but soon we started to get really tired. 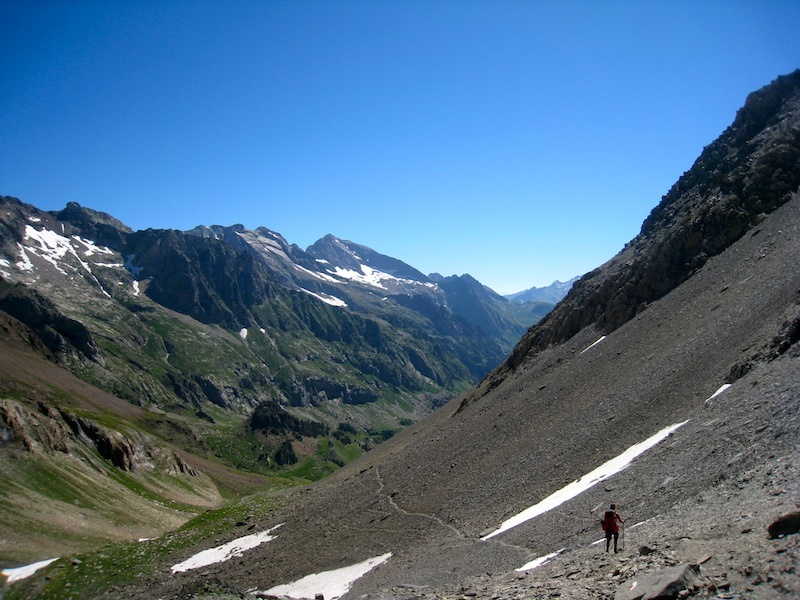 We could hardly lift our feet the last 1,5 km up to the refugio Viados (1780 m) . We hadn’t booked beds and it turned out it was fully booked! 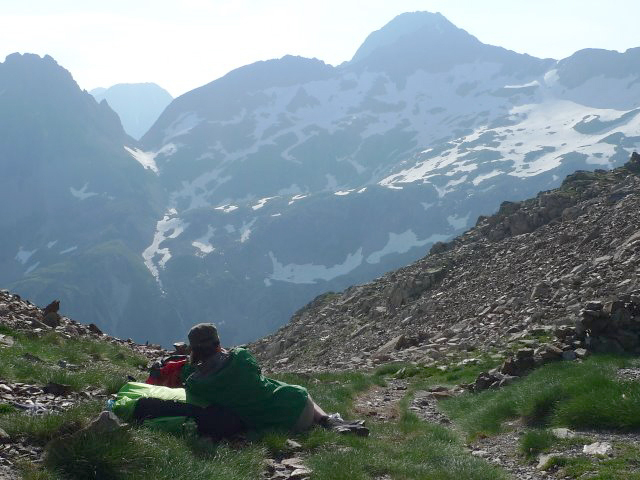 We sat down outside the refuge to catch our breath, digest the bad news and to think… what to do?! But then the girl who worked at the place came outside and said she would work it out somehow and gave us beds. I guess she saw how tired we were and felt sorry for us. We were really thankful and had a great evening at this wonderful place. We had dinner noodle soup, beans with garlic, potatoes, meat and a peach for dessert. 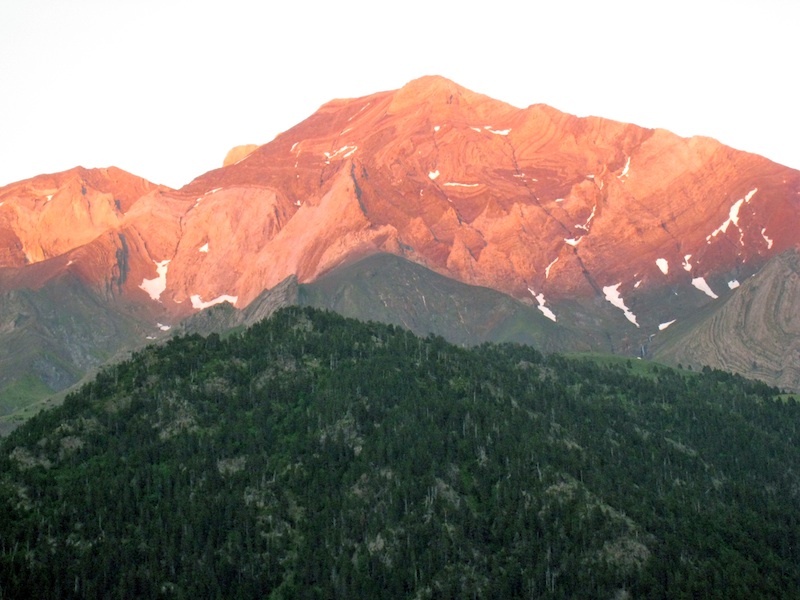 The rest of the evening we spent outside looking at a wonderful mountain constantly changing color as the sun went down. After seven days of long hours walking we were quite tired. We loved this place and decided to stay at and relax for one day. We slept in and didn’t get up until eight thirty. We had hot chocolate and a cheese sandwich for breakfast outside the refuge. 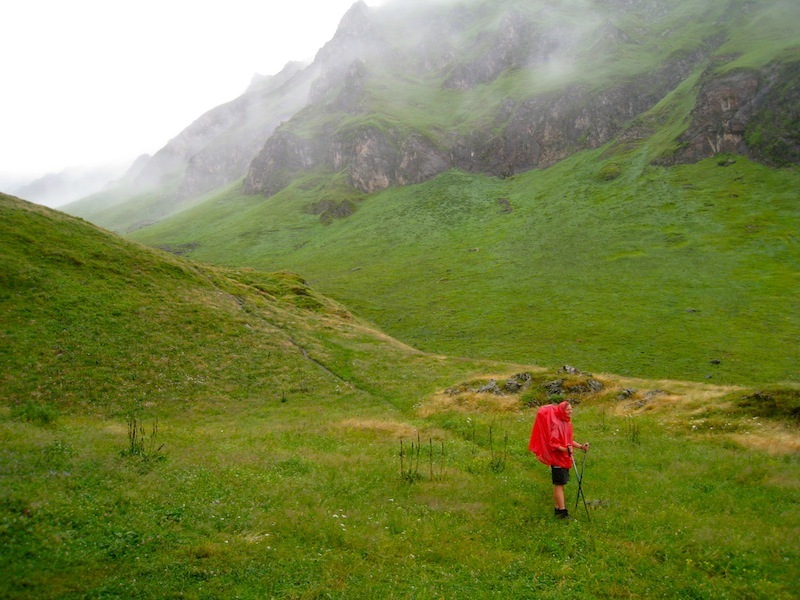 We washed all our hiking cloths and went for a short walk in the area around the refuge. …four people came toward us and said ”Thanks for the wine”. 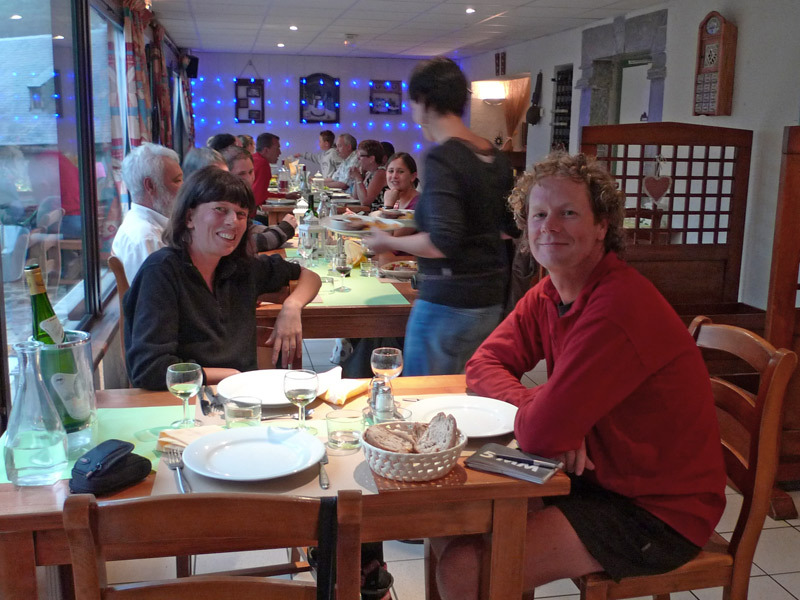 We recognized them from two nights before, at Casa Marion in Parzan, were we had given them the rest of our wine. Half of the group Maribel and Ricardo were continuing and the other half Yakir and Idan were staying the night to catch a bus the next morning towards Madrid. We had some chat and said goodbye to Maribel and Ricardo. We had a great afternoon and evening together with Yakir and Idan, two nice fellows from Israel. We talked, ate dinner and looked at the sunset. Since it was Saturday and the refuge was fully booked Yakir and Idan didn’t get any beds, they slept outside under the stars. We got two beds in a small simple uninsulated house outside the refuge along with some other people. We didn’t mind and we slept well. We got up early and ate some breakfast at the refuge, it was sweet as usual at the refuges, but there was a lot of different things like muffins, jam and croissant that we could bring with us and eat as snack on our way. We said goodbye to our new friends and started our walk at eight a clock. 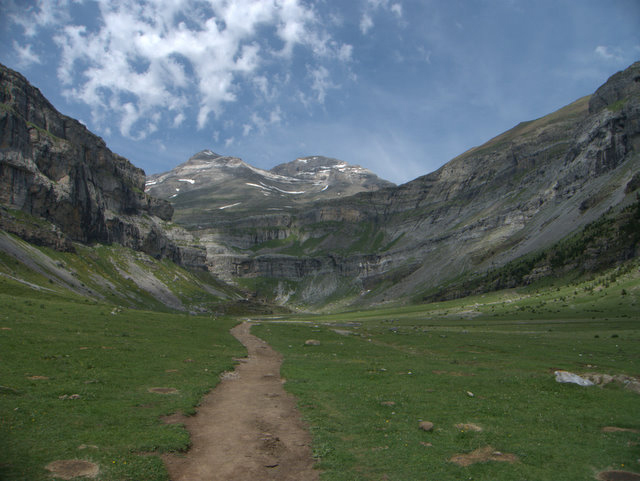 We started by walking down in the valley below the refuge and followed a mountain crest up in into a new valley. We climbed upwards for about an hour. 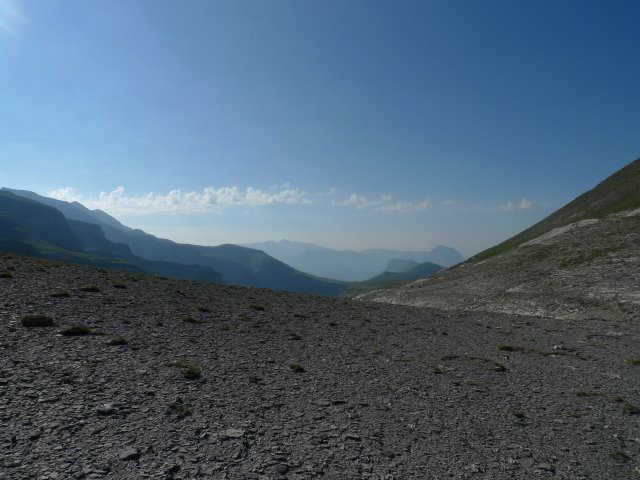 When we came up a new view opened up for us, barren and stony. To begin with it was very steep and there was some snow, we had to take the down descent carefully. A bit further down it was greener and we sat down and had something to eat. Some dried bread and canned sardines which were a bit to spicy. 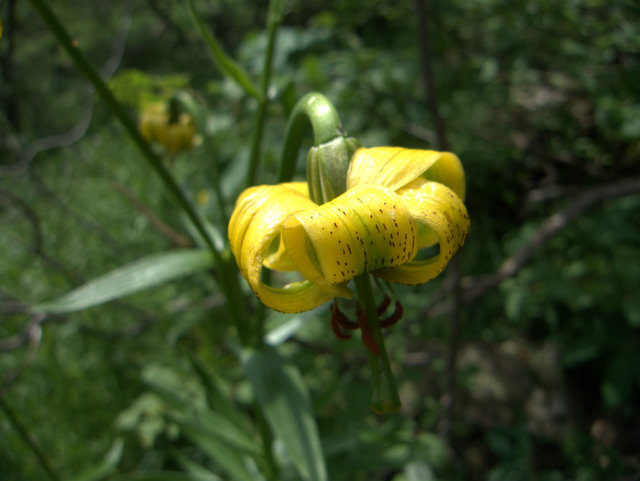 We continued further down and there was a great variety of flowers, especially orchids and Iris. We past by a Refuge Estos and had a lemonade. We talked to a Danish couple for a while. 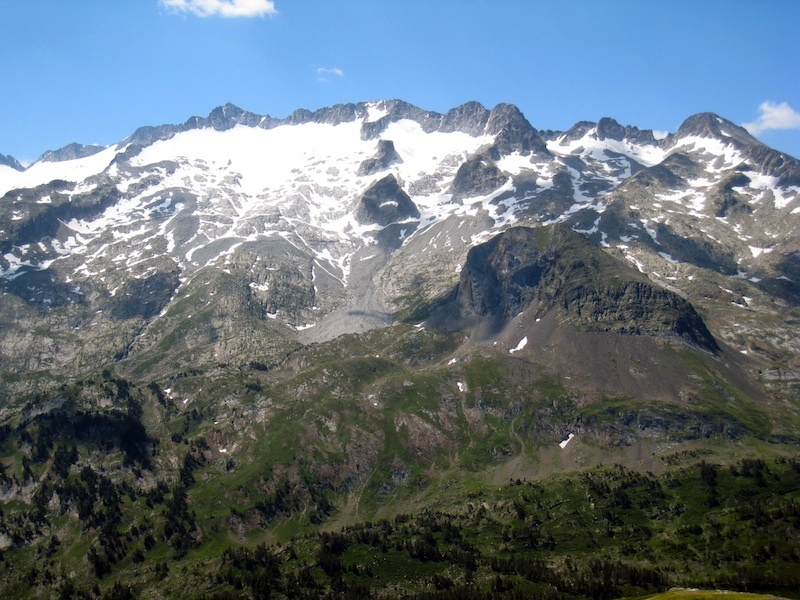 They had climbed the highest mountain of the Pyrenees, Anesto. We said goodbye and continued further down. The landscape wasn’t as exciting as before and in the end we had to follow a small road. We came down to a bigger road with two campsites, we chose the smaller one, it seemed ok. We put up our tent and went shopping for food in the other camping. We where glad we didn’t stay at that one as there was mostly permanent campers in huge caravans. Back at our camping we sat down to have some wine and some food at the restaurant. To our surprise we met Maribel and Ricardo, the Spanish friends of Yakir and Idan and to whom we had said goodbye to the day before. They made us company and we had a nice evening together, with red wine and delicious lamb. We went to bed around nine a clock. We woke up and noticed we had been visited by snails during the night, we could follow the snail trails all over our tent, they had also been around in our shoos. Not so pleasant and difficult to clean. We sat down at the café and had our own breakfast. Said good bye to our friends. 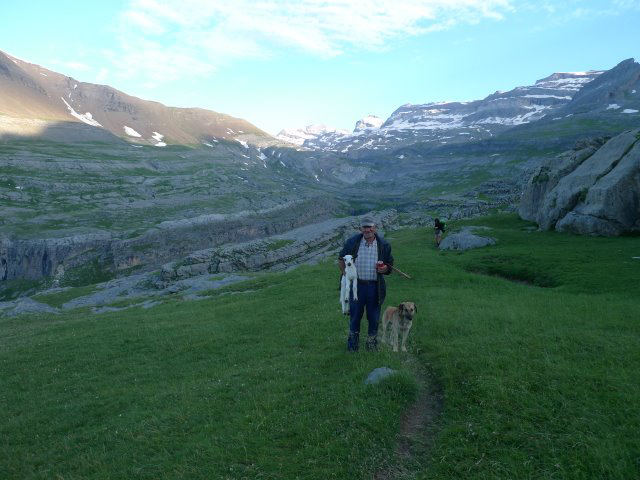 They where continuing to follow the GR11 but we were heading north and up the mountain via the Port de Venasque to cross the border back to France. As we don’t like walking on a road we had decided to take the bus up to La Besurta and start from there. For some reason we didn’t fill up any water, we had an idea that it would be possible at La Besurta. But unfortunately it wasn’t and we soon realized that we couldn’t walk up the steep mountain without any water. So we had to take some water from a small stream in the cow field and use our Micropur tablets to disinfects clear water and destroys bacteria, amoebas and viruses to make it drinkable (you just have to wait 30 minutes for it to work). When the water was ready we started our climb up towards France. 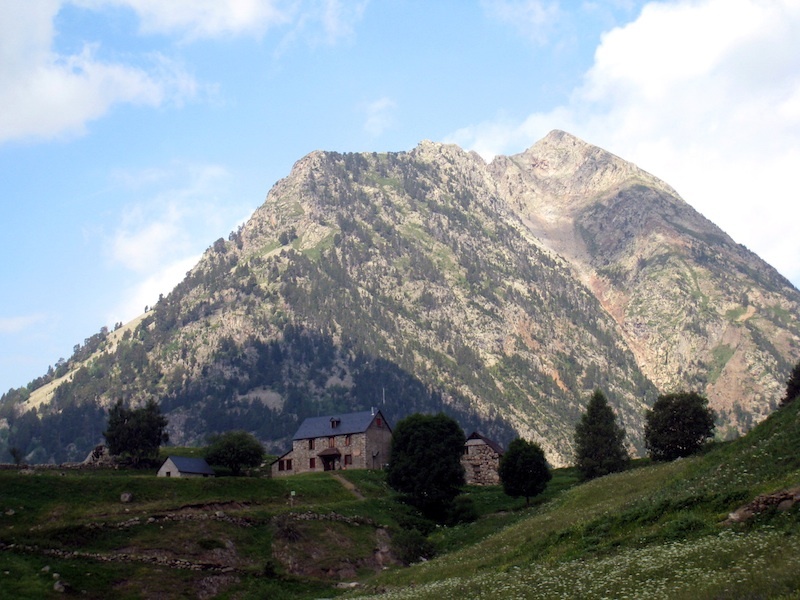 We were surrounded by beautiful surroundings with high mountains everywhere; in our back we had an overview of the highest mountain in the Pyrenees, El Aneto, 3404 metre. The area was filled with cows and we heard the sound of cow-clocks everywhere. 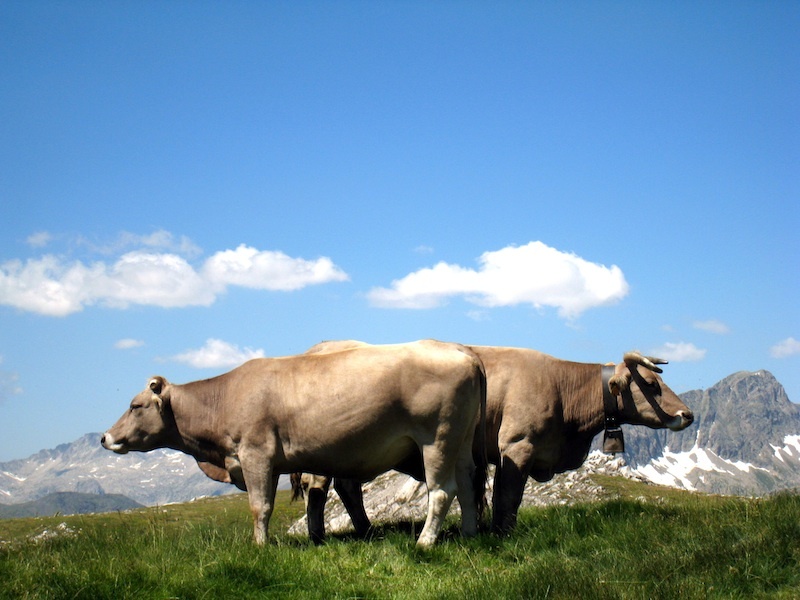 A really nice and common sound in the Pyrenees, both cows and ships wear clocks around their necks . 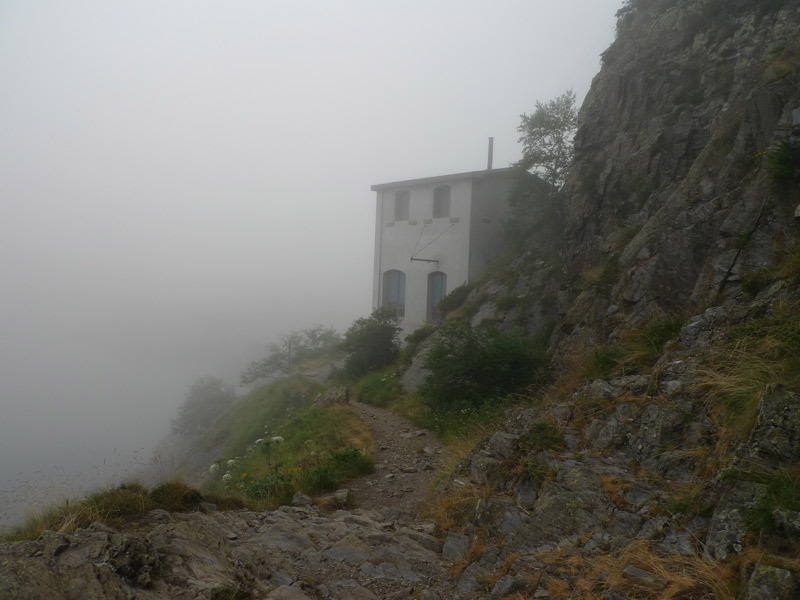 We came up to the Port de Venasque (2444 m), a narrow portal in the mountain to cross the border. Leaving Spain felt a bit sad but it was also nice to come back to France again. The two countries differ quite a bit from each other. 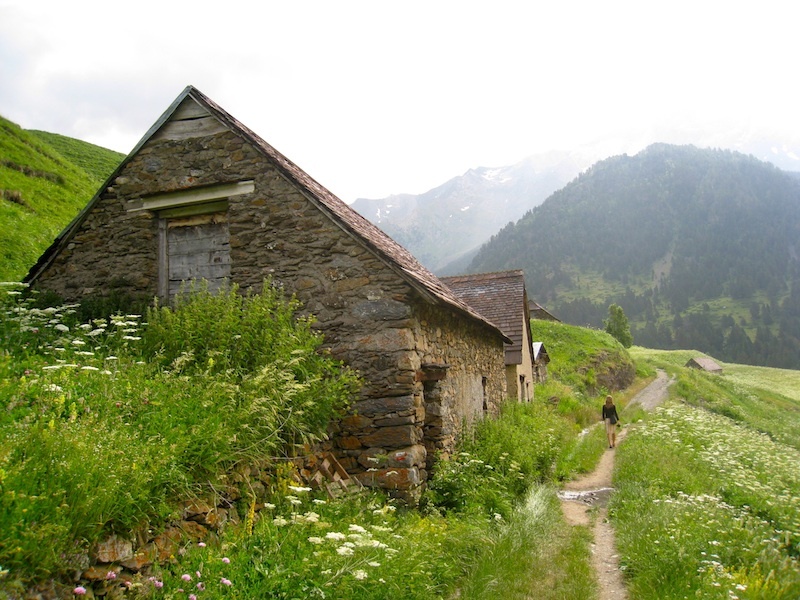 The Spanish side of the Pyrenees is more dramatic and bare and France is more green and soft. We climbed down towards some lakes. 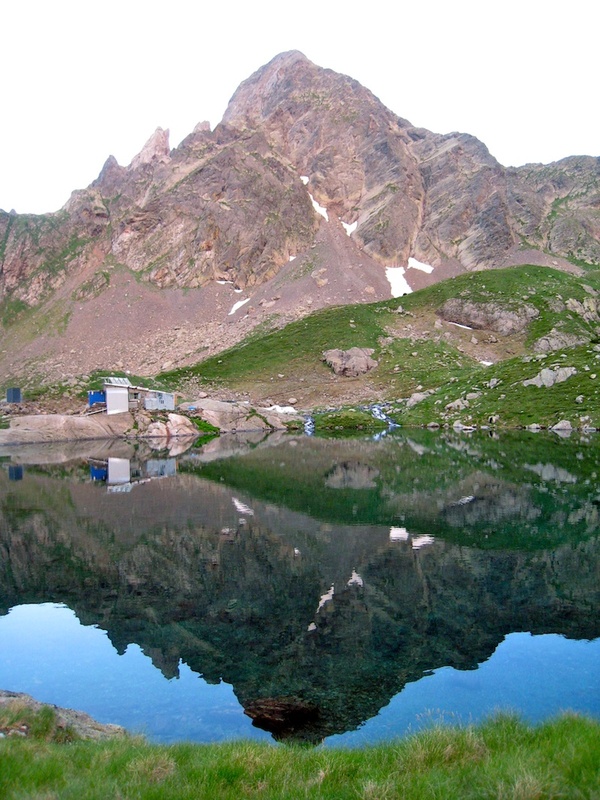 At one of the lakes a small and nice Gite was placed, Refuge de Venasque. We decided to stay there for the night. We raised our tent and had a lovely and lazy afternoon in the sun by the lake. Anna made some repairmen on Ýrrs back-pack and Ýrr read a book. At 7 pm the dinner was served. 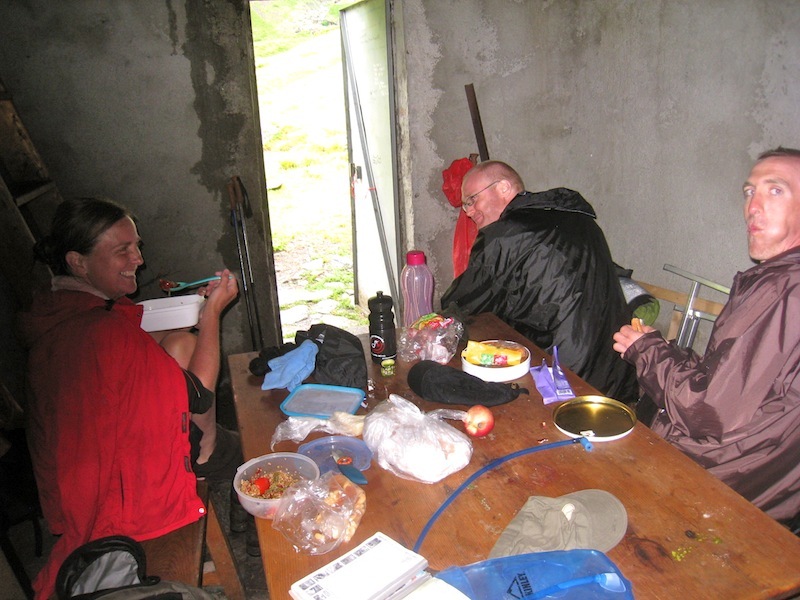 The best food we had on this hike, potato soup, pasta with duck, cheese and chocolate cake. 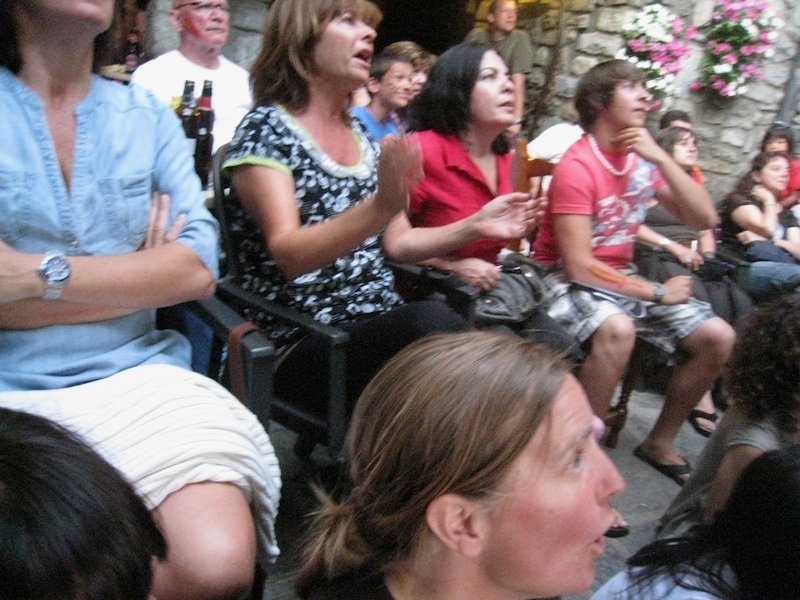 After dinner there was a woman who had a lecture about the birds of prey that can be seen in the Pyrenees. Unfortunately it was in French but we did understand some, she was very pedagogic in showing images of birds in relation to human size, to show us how big some of them can be. 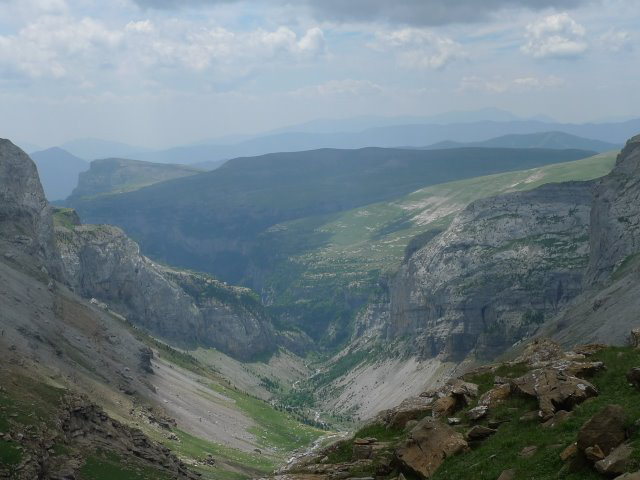 As an example of birds we had seen several times through our hike is the The Griffon Vultures with a wingspan of around two and a half meters and the Lammergeier with a wingspan of up to 2.8 metres. These huge birds are quite powerful to see flying over your head, sometimes so close that you hear them gliding in the air. After a while we gave up the lecture and took a evening walk and admired the fantastic view before heading back to the tent to sleep. We woke up at 7 am, packed our stuff and sat down outside the refuge, bought a coffee and ate our own breakfast, bread and cheese. We really enjoyed this wonderful place and this beautiful morning. But we had to keep moving. We started walking down the valley. It was a little steep and we walked in zig zag. 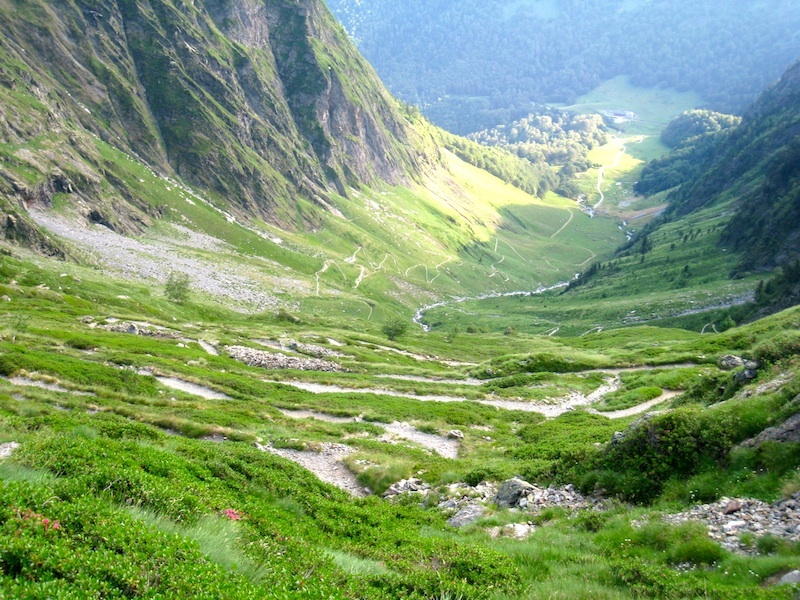 The zig zag track down the valley. After about 1,5 h we came down to a road and a parking lot. Our plan was to hitchhike from here, but there were no cars going in our direction. 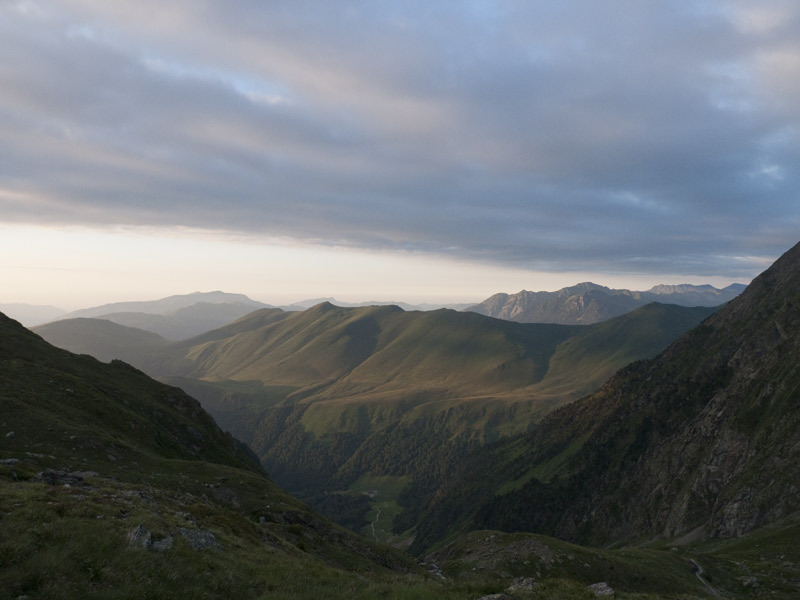 We walked on a asphalt road for about an hour before we met a family outside their house that offered us a lift, we squeezed us into the backseat together with the two teenage daughters and drove some more km to Luchon. 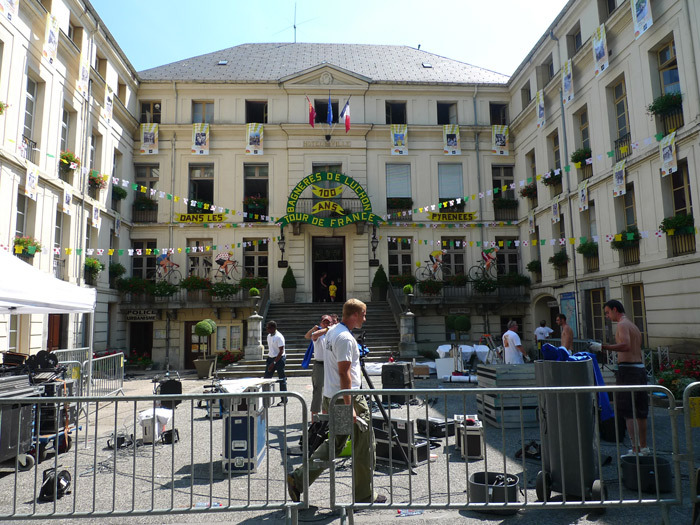 We came to Luchon just some minutes after the Tour de France bikers left the place. It was like arriving to a party that was over. We found a hotel, ate lunch at a café by the square and had a glass of Sangria. We walked around in the village for hours, we were a little bored. It’s hard to come to a big village after days up in the mountains. We had dinner at the hotel restaurant. After dinner we visited the church, inside there were three sporty dressed men warming up for the concert later in the evening. They sang nice and we’d listen for a while before we went back to our hotel room, we did some reading before we fell asleep. 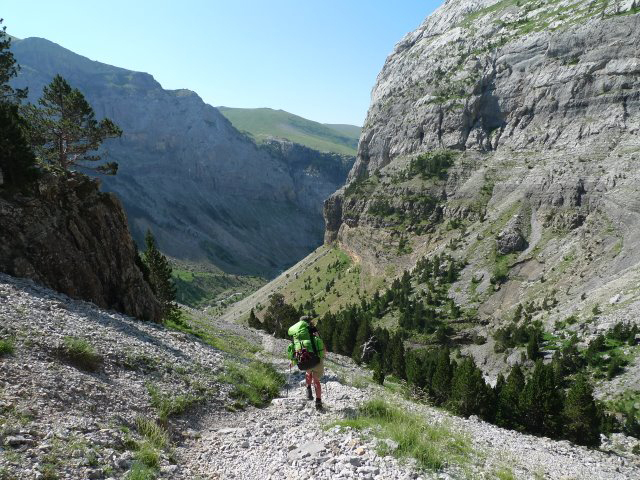 The trail GR 10 runs between Hendaye by the Atlantic ocean and Banyuls-sur-Mer by the Mediterranean ocean on the French side of the Pyrenees. 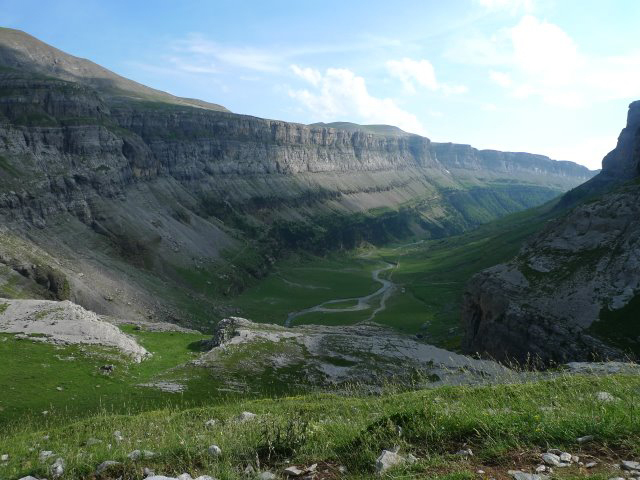 It is divided into three sections the west, the middle and the east. It takes about five weeks to walk the entire length. You can choose to walk only a section depending on how much time you have and what part you are interested in. We decided to start at St-Jean-Pied-de-Port. A lot of people start their walk from there but most of them are on their way to Santiago de Compostela in Spain , making the famous pilgrimage. 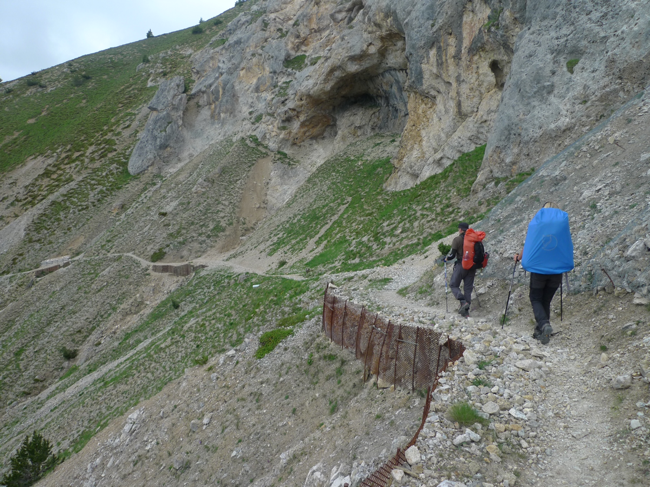 But we walked in the other direction, following GR10 going west. It was beautiful and alternating. 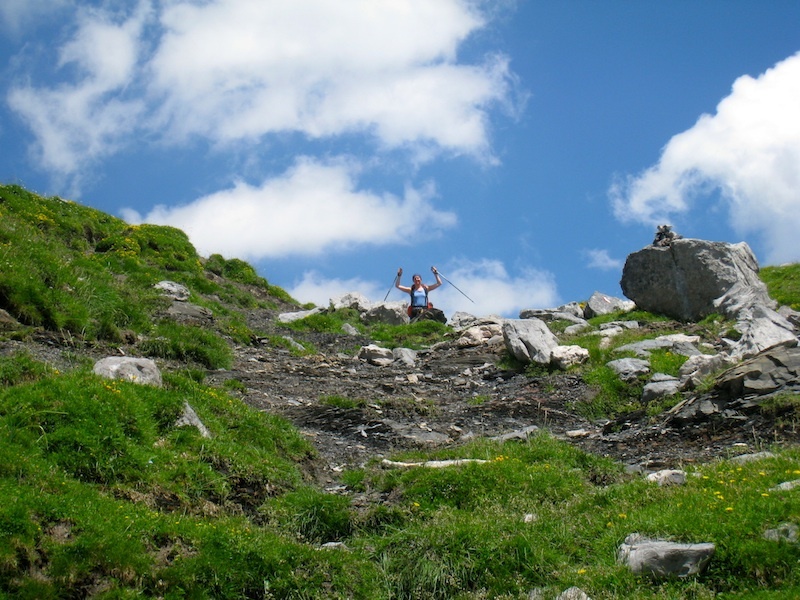 We found it difficult and were always really tired in the evenings, but this was our first longer hike in the mountains and we didn’t really know what to expect. I don’t think we would find this as difficult today. 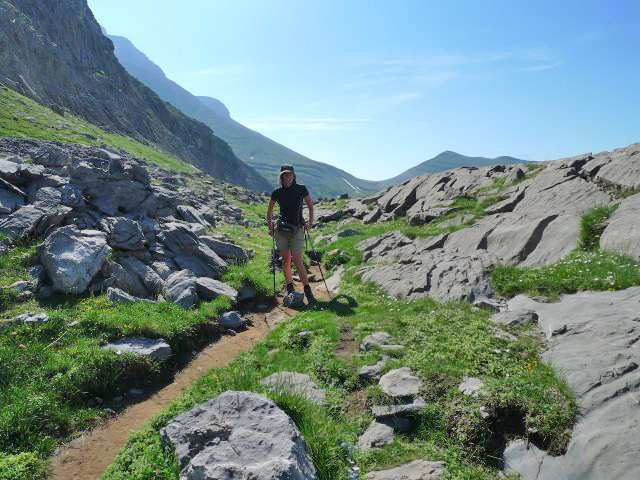 This part of the GR10 is not really touristic, we didn’t really meet tourists other than the ones that were doing the GR10. There is a gite (cottage) in the end of every stage were you can sleep. 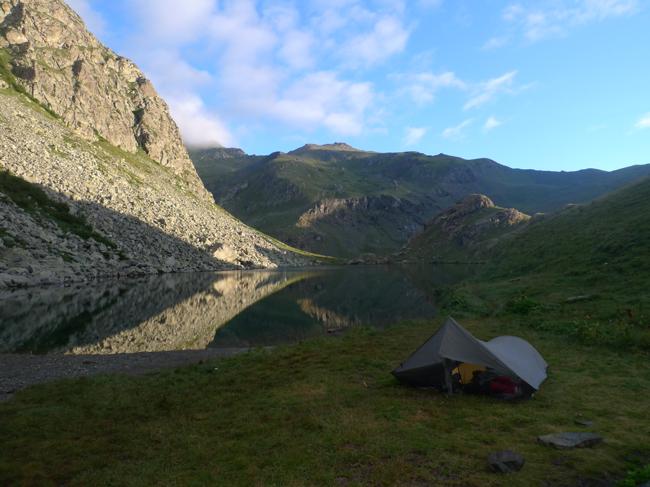 You can also sleep in a tent near the gite but it is also permitted to set up a tent in the wilderness. It’s possible to have dinner in the gites, then everybody eats the same food together. The food was really tasty most of the time and it can be a nice social thing to do sometimes. Often there is a kitchen in the gite if you prefer to cook your own food. If you put your tent outside the gite you pay less but you can still use the facilities. Some nights you spend in small villages where you can buy some food in a store. At some gites you could buy some food like bread, pasta and gas for your stove. We didn’t find the breakfast at the gites appealing, most of the time it was only bread and jam, we made our own breakfast most of the time. You can always buy coffee at the gites, but the quality wasn´t always good. The wine, on the other hand, always tasted good. We really loved the farm houses we passed quite often on this trip where you can buy cheese. Water was never a problem, there was fresh water everywhere in the gites and we often passed small streams while hiking. by Douglas Streatfield-James from Trailblazer, we really liked it and we can really recommend it, you find everything you need to know in this book written in a personal way. More about this trip will soon be out! We woke up early, eager to leave this touristic village and to get higher up in the mountains again. We ran to the supermarket and bought some food and had breakfast in our room. It was cloudy and we didn’t see the mountains. We had a long day ahead with 2000 m of climbing to start with. 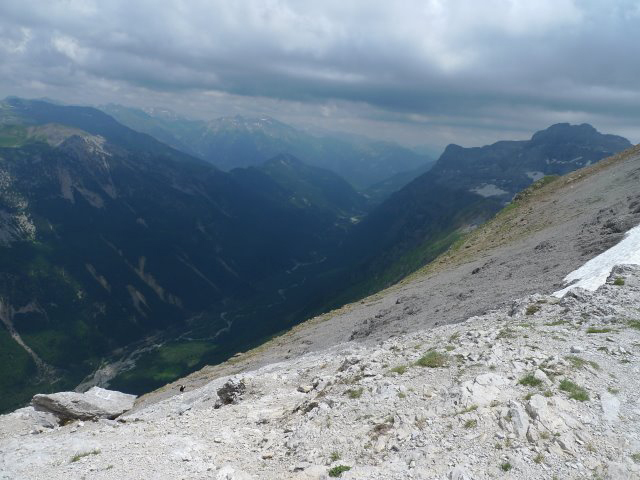 According to the guidebook the first 1200m of the climbing was on a road and it was boring and tiering and there was a cabin lift. We decided to take the lift. Anna had never taken a cabin lift before and she was quite nervous. The lift was supposed to open at 9.30 am but something was wrong and we had to wait for more than an hour before it was fixed. 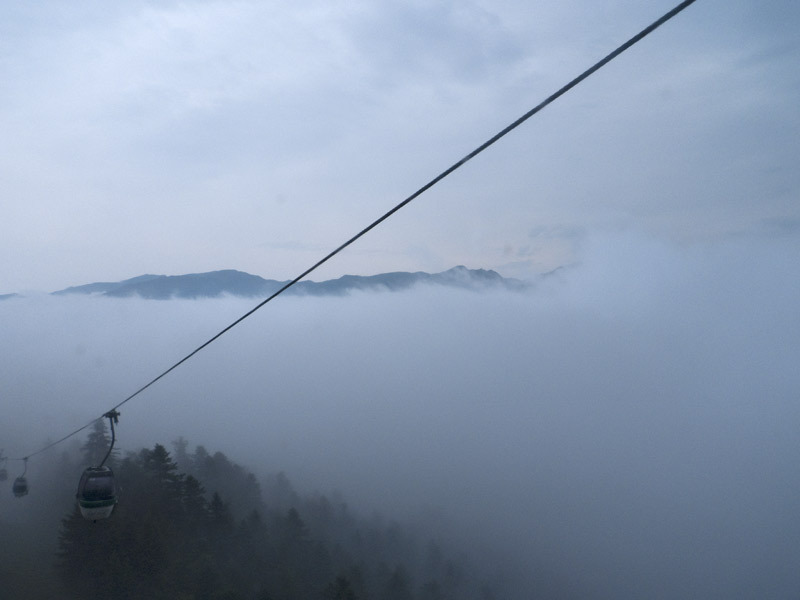 The lift took us to a small ugly ski resort but the view was fantastic, we were up above the clouds looking at the tops of the mountains and the clouds were resting in the valley. It was like magic! We started climbing and we had some walking up and down. Before the last climbing we had lunch. Filled with new energy we went to the top. We started to walk down in zig zag through the steepest part. We walked in a green valley filled with flowers and some trees. It started to rain a little in the afternoon and it started to get foggy, we came to a lake and we could hardly discern it because of the fog. There was an auberge where we stopped for a soda. The fog was atmospheric. We walked really fast the last hour, the weather was getting worse and we just made it to the gite before it started to rain really bad. We got our own little room with a shower. There was a kitchen in this gite and we cooked vegetables with coconut milk and bulgur. We even made dessert strawberry and rhubarb compote. 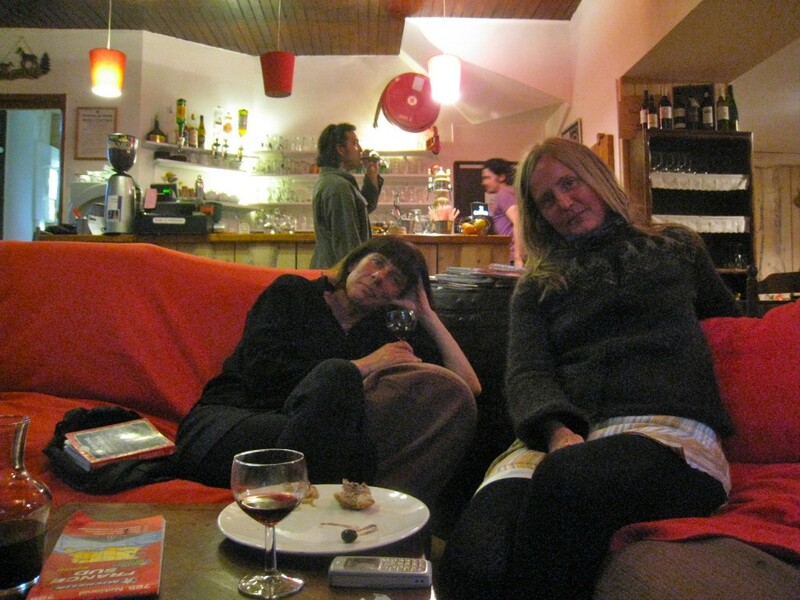 After dinner we went inside the bar/restaurant and sat down in a sofa by a fireplace and bought a glass of wine. Very cozy evening and the guy that worked at the gite didn’t just make sure we got the best seats he also lent us a lap top and gave us a plate with different sausages and cheese. We said good night around ten o’clock. We woke up to a gray rainy day with some thunder. At first we decided not to walk but two French guys we talked to at breakfast made us change our minds. We confident each other that some rain wouldn’t hurt. We started by walking upwards through a forest, it didn’t rain so much and we were protected by the trees. But shorty after we came out of the forest it started to rain really heavily. After a while we where soaking wet down to our boots. It was like walking in water. 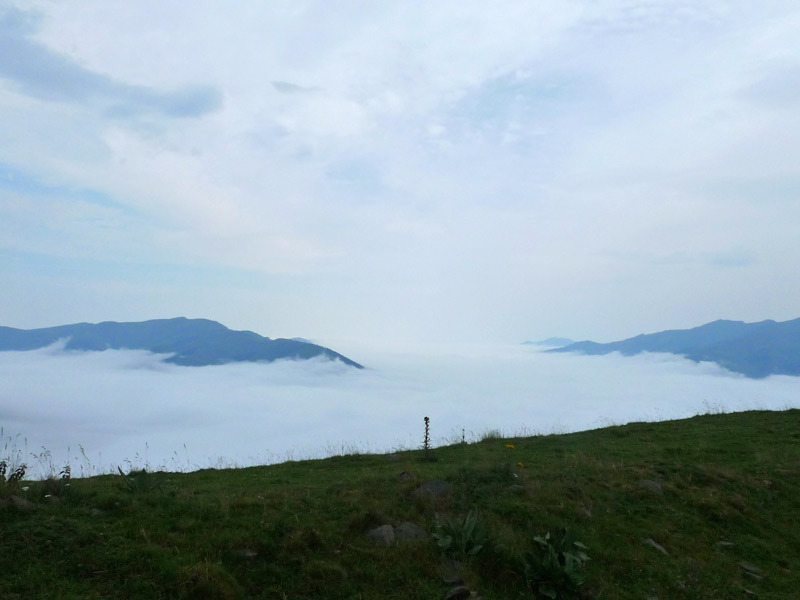 We came to a valley, we couldn’t see much because of the fog. It started to thunder and we felt like we were caught in a thunder cloud. It didn’t feel like the best place to be at the moment. There was nowhere to hide from the rain or the thunder; we stopped by a big stone that was at least a little bit higher than us, it wasn’t much of a shelter but we waited for the thunder to move on. After a while we continued upwards. When we came to the top, we almost stepped into a tent. We said hello but we got no answer (later we would meet the owner of the tent). We continued down the hill, the rain continued poring down. 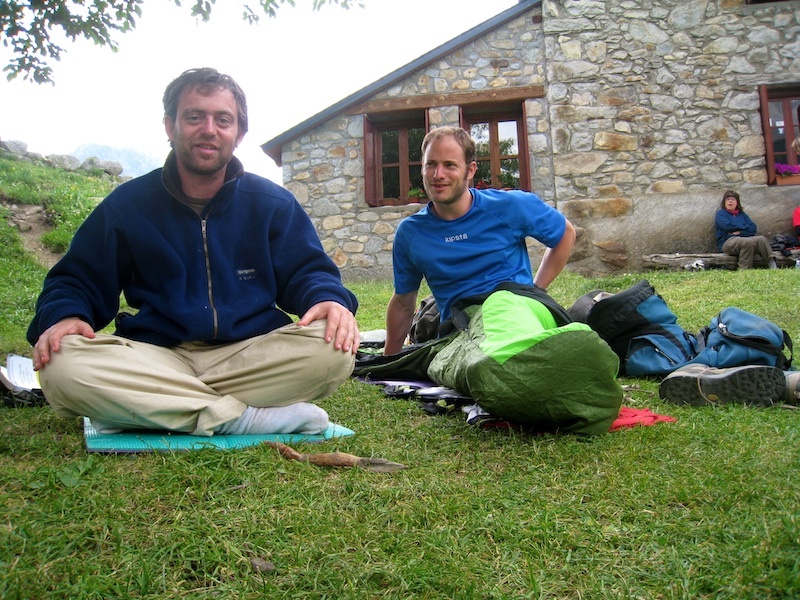 Finally we came down to a small shelter where we met the two French guys from breakfast. They were surprised to see us as we had told them we were not walking in this rain. They seemed to regret their decision (who can blame them) and they where not in a good mood. We tried to keep up the spirit by making some jokes about the whole situation but we didn’t get much of a response. Lunch together with two French guys. We had some lunch and then we continued, because we were already wet there was no point waiting for the rain to stop. Outside of the shelter we met Arne, a Dutch guy. He was the owner of the tent we had passed by earlier. 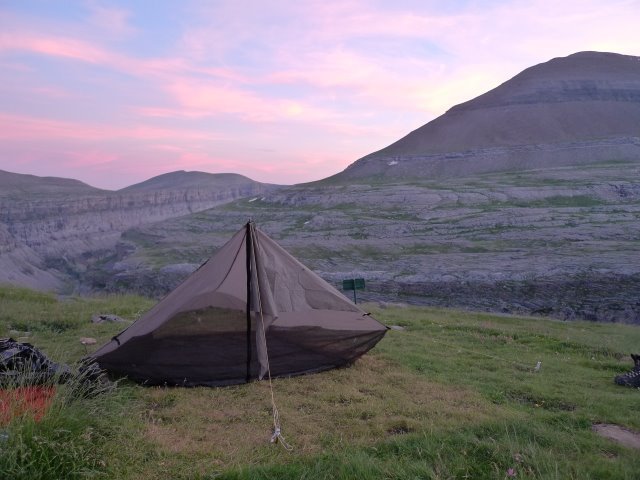 He had spent the night at the top and had stayed in his tent to wait for the rain to stop, but it didn’t. After he heard us passing by he decided to continue despite the rain. And now he hooked up with us and we continued walking together. We continued down towards Germ, we got more and more wet and at some moments it rained so heavily it felt like a waterfall. We found a place to stay in the small village, Germ at a auberge. Luckily we got a big room with some radiators, we could dry our clothes’ but most importantly our shoos. Down in the restaurant we met Arne again and we had dinner together. 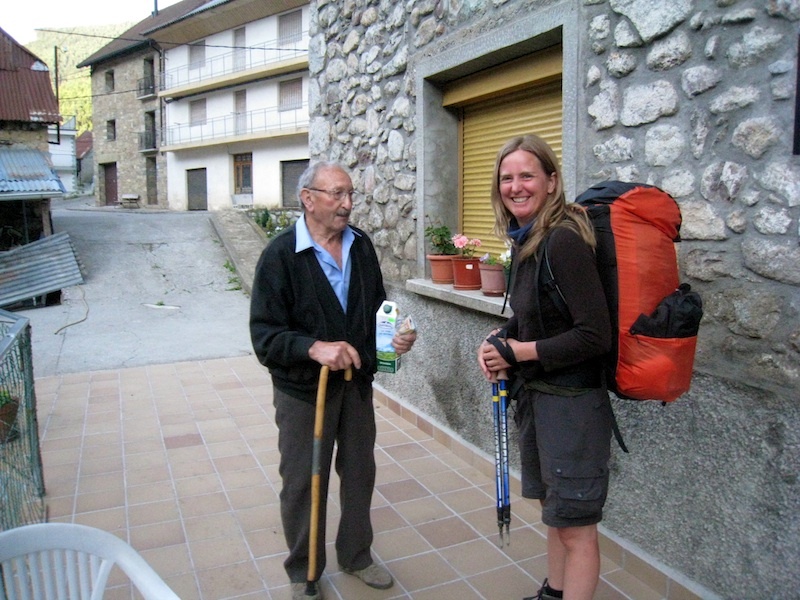 He had been hiking in the Pyrenees for several years and came back every year. We had a nice evening. As usual we went to bed at 10 pm. Ýrr and Arne in the restaurant.